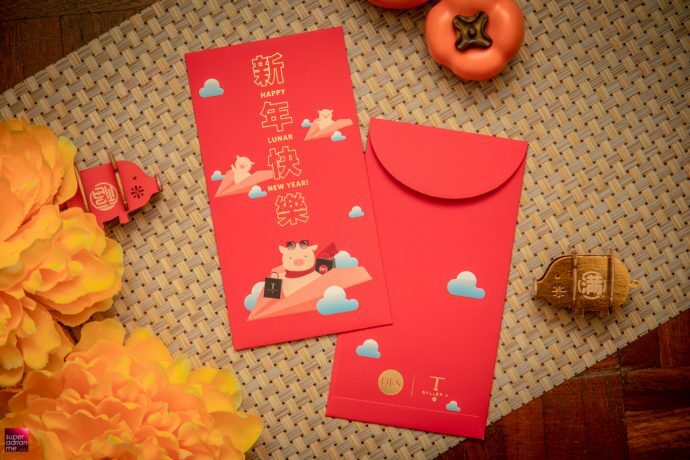 It’s PIGGY YEAR… and the ANG BAO looks great!!! 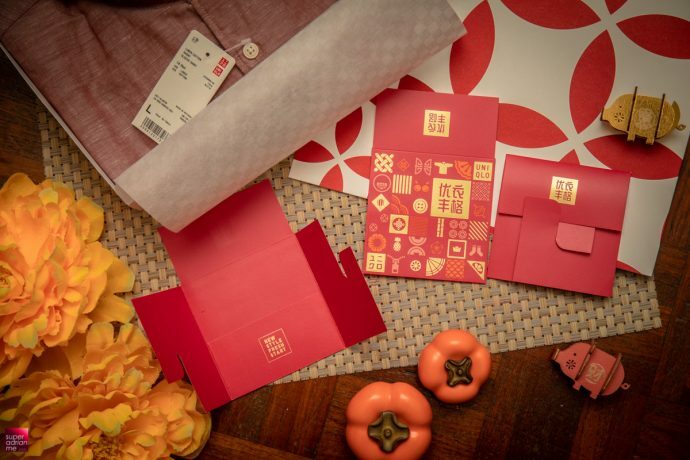 It’s that time of the year again where we gather all our influence and put in a lot of hard work to collect red packets, aka ANG BAOS or Lai See or 红包 🧧, from Singapore and around Asia. 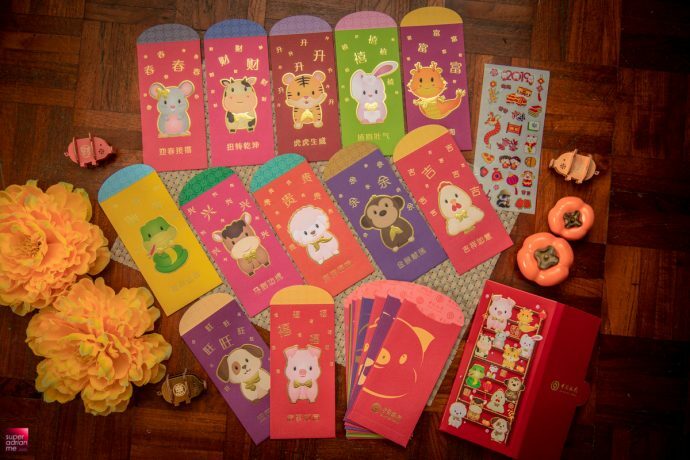 The Ang Baos featured are all produced by brands to be given out as souvenirs or redemption items to their customers. 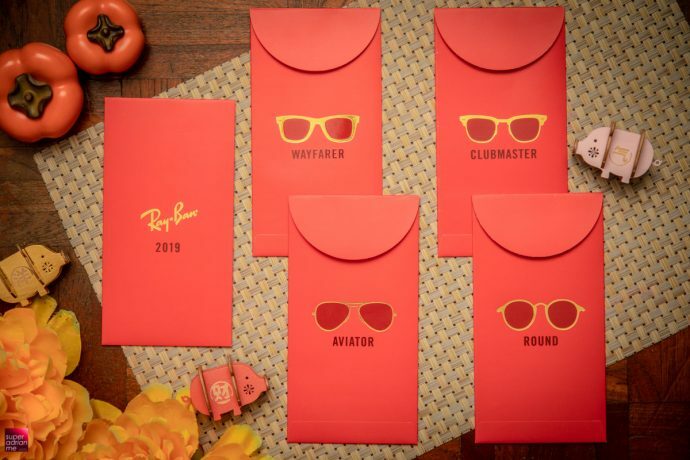 Some may be harder to get as they are given out as corporate gifts to partners. 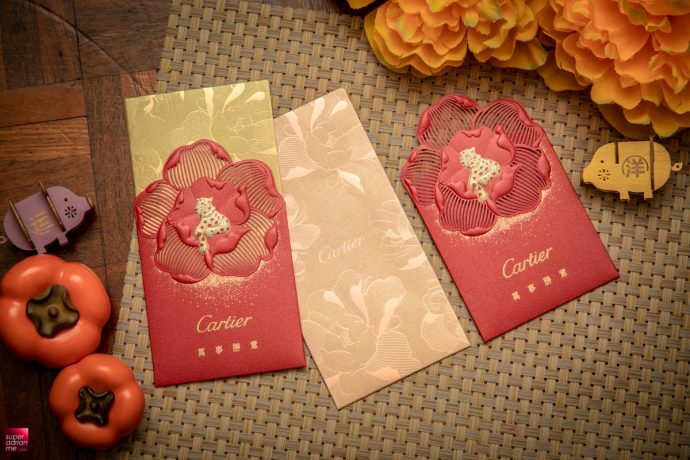 With over hundred designs this year, we bring you the most authoritative Ang Bao design feature over the past few years. 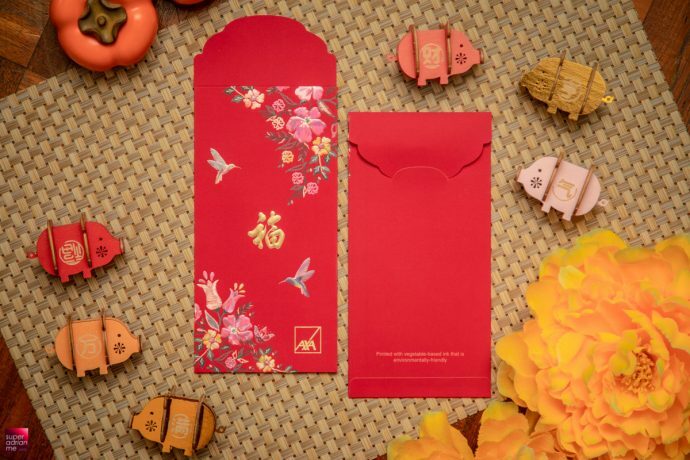 So if you are an Ang Bao collector, we hope this you help you with your collection. 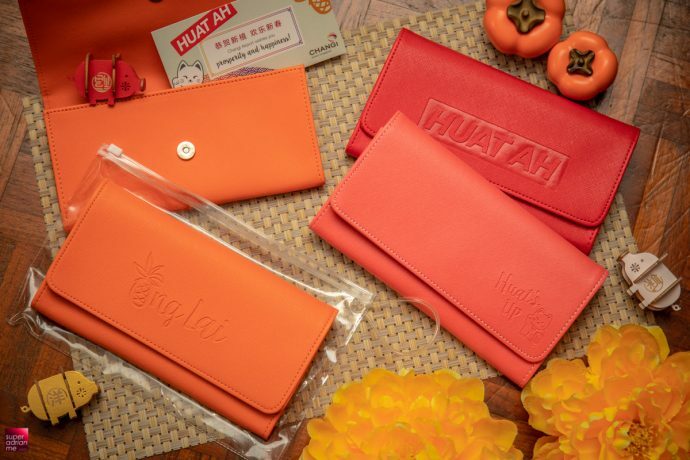 We are also giving away ONE ANG BAO HUAT HUAT BAGS (filled with random Ang Baos from the 2019 collection featured in this article) to THREE lucky readers. 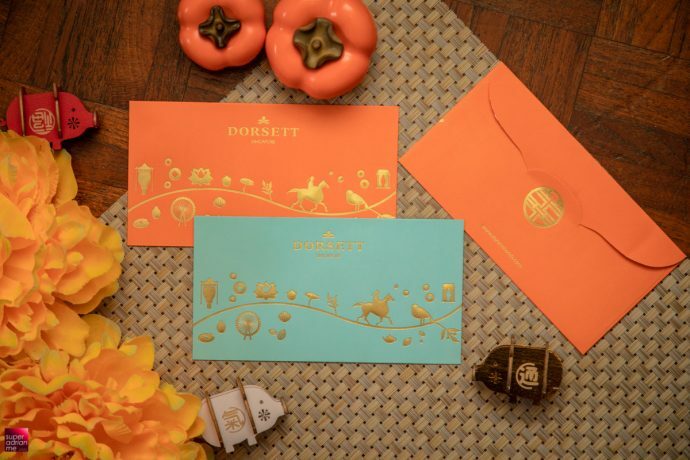 Look out for details of how to participate here. 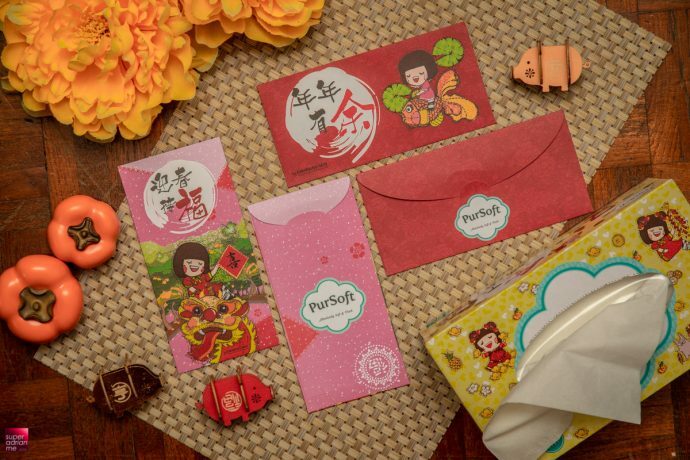 There are still many red packets that we are consolidating from brands. 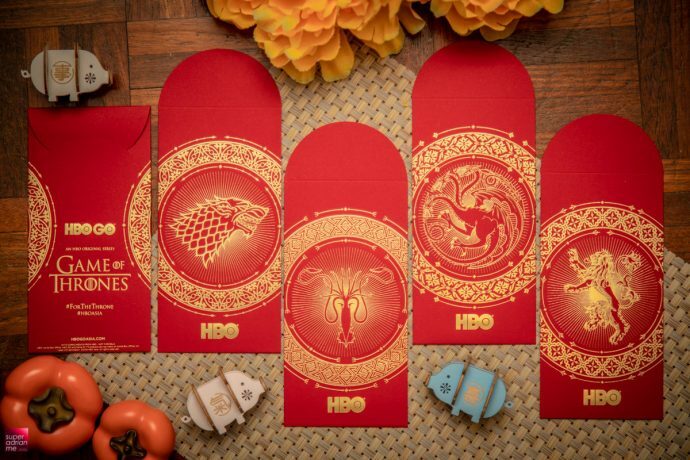 We will be updating them into this post as quickly as we can. 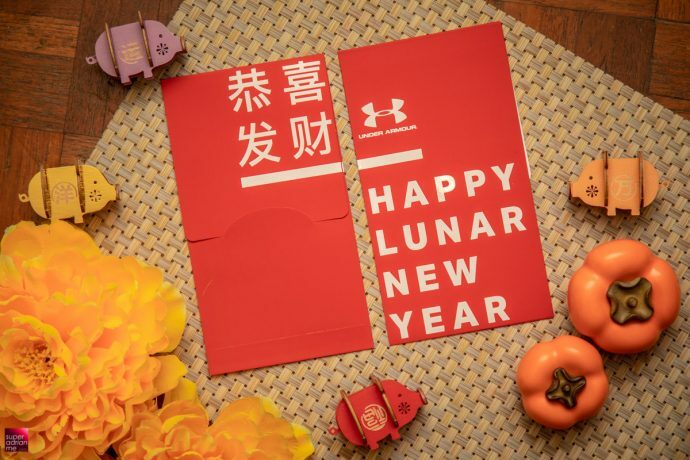 Instead of just giving out red packets, more brands are giving out pouches and bags that you can even reuse after Chinese New Year. 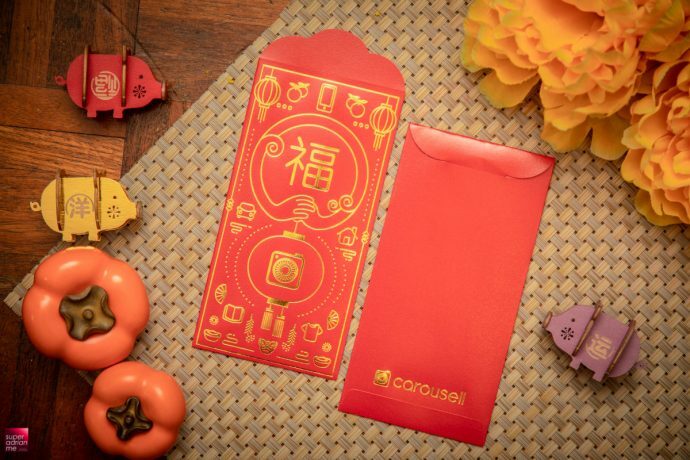 Spend a minimum of S$60 (or S$80 at supermarkets) at the Public Area of Changi Airport anytime before 19 February 2019 to redeem an exclusive Chinese New Year red packet organiser at $5 or $8. 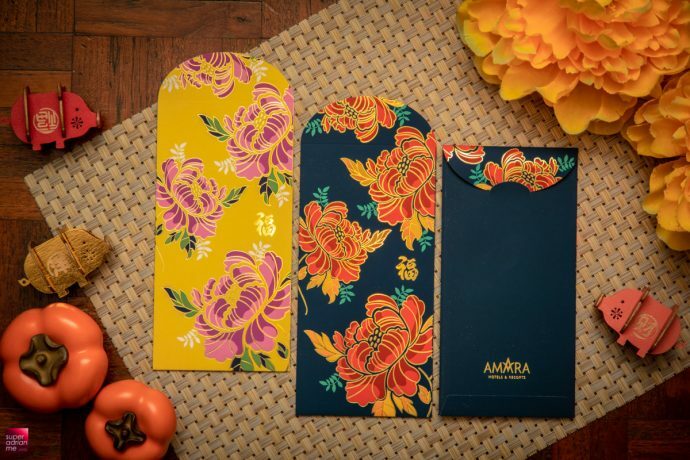 There are three designs to choose from. 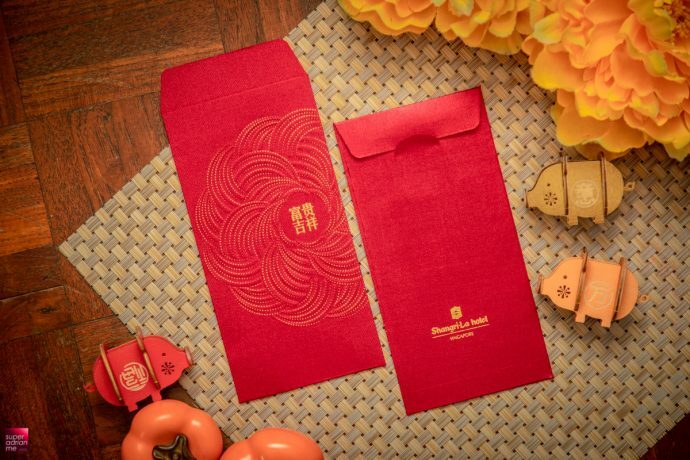 The limited edition “Prosperous HAPPIG” red packets from Harbour City, Hong Kong’s largest shopping mall, comes with a trendy knot bag. 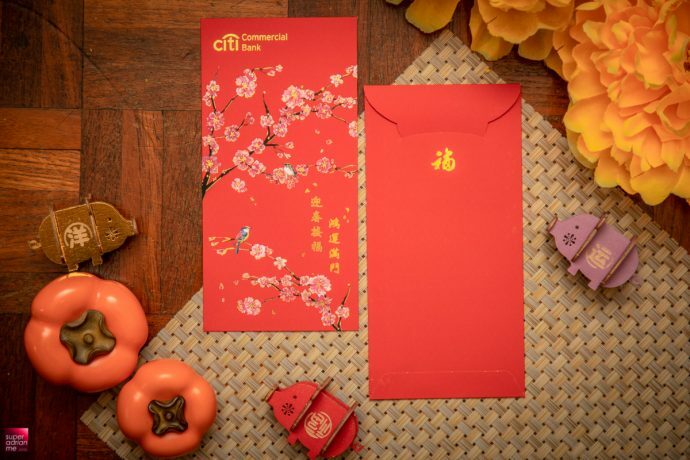 We always look forward to receiving this from our friends at Harbour City every year, because their designs are always out-of-the-world. 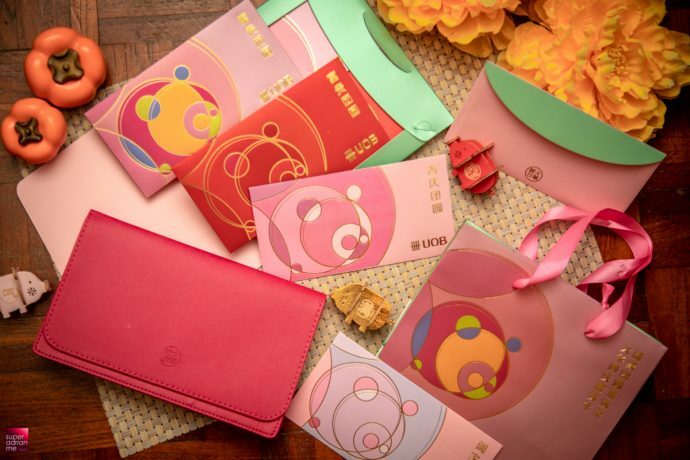 With same-day spending of HK$1,500 and above, you can get ONE red packet set by donating HK$50 to the Hong Kong Cancer Foundation or donate HK$150 to get ONE red packet with knot bag set. 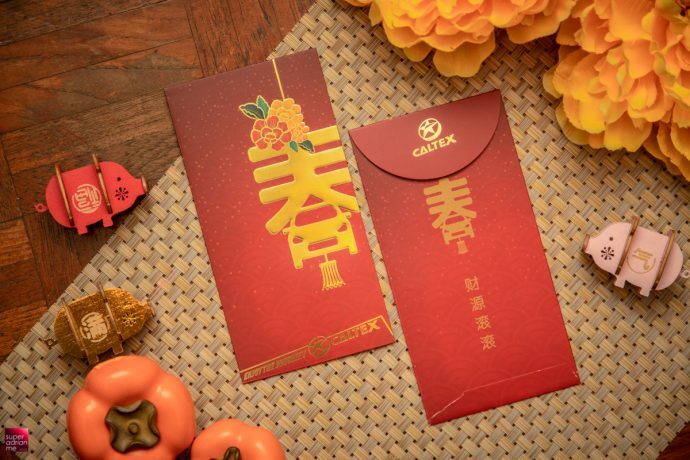 Redemption starts from now till 4 February 2019. 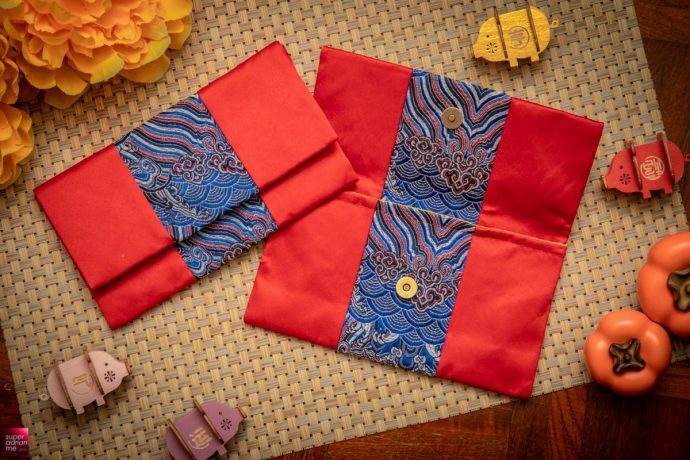 Food Republic has teamed up with special need artisans from PersonalisedLove.com to design a classic, oriental fabric ang pow pouch. 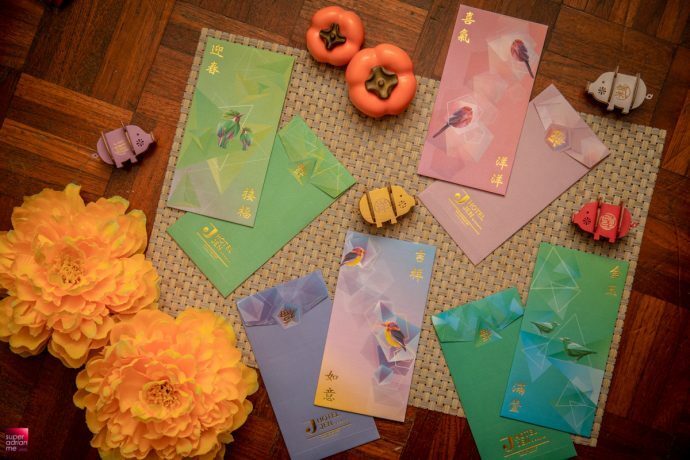 This initiative supports the youth beneficiaries from Personalisedlove by empowering them to be contributing members of society and to realise their full potential. 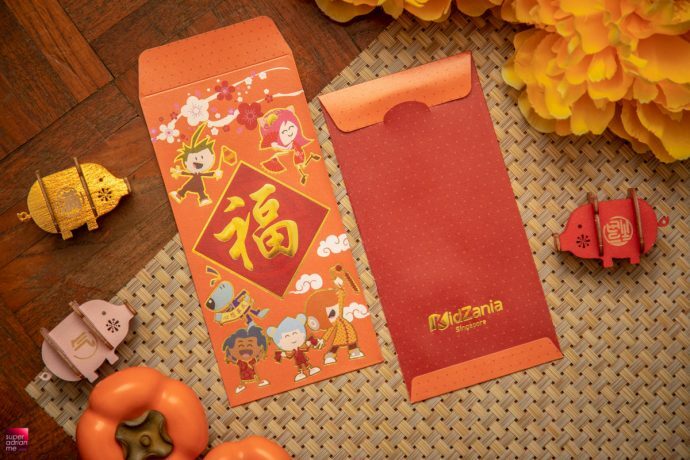 To get the Food Republic CNY Ang Bao holder, simply spend a minimum of S$10 on food and purchase any 2 cans of Pokka drinks to redeem a free Chinese New Year Ang Pow Holder. 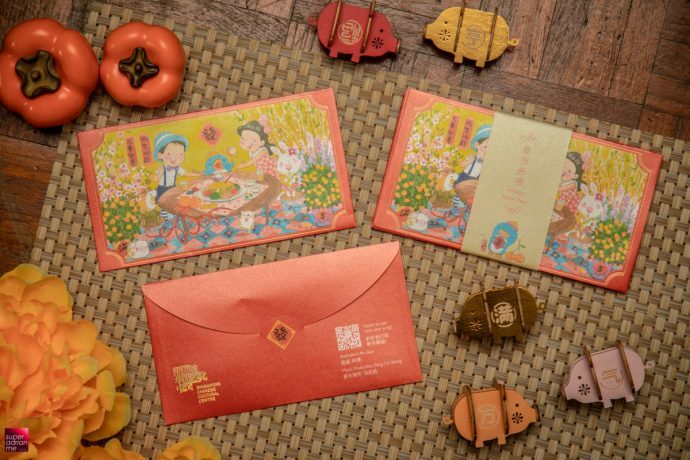 This year’s red packet design from UOB is themed reunion. 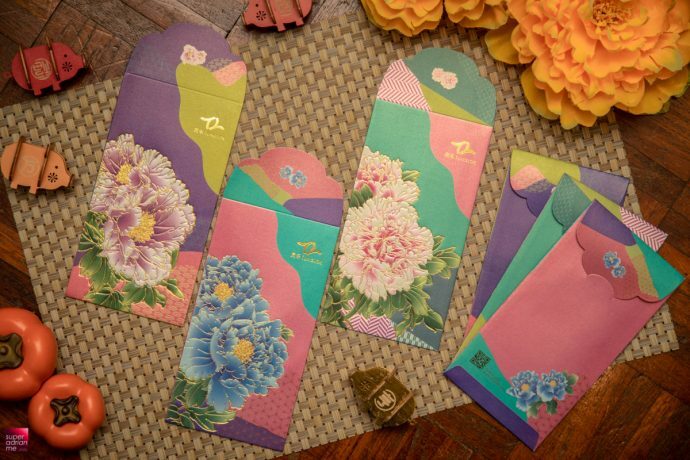 There are three designs. 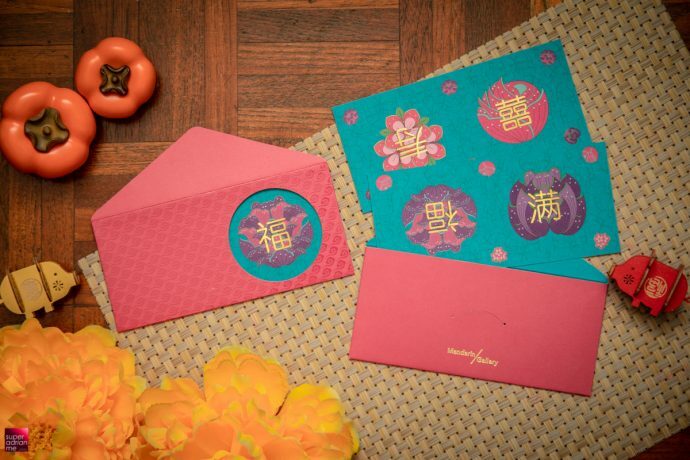 Harmony that reunites with your circle of family and friends. 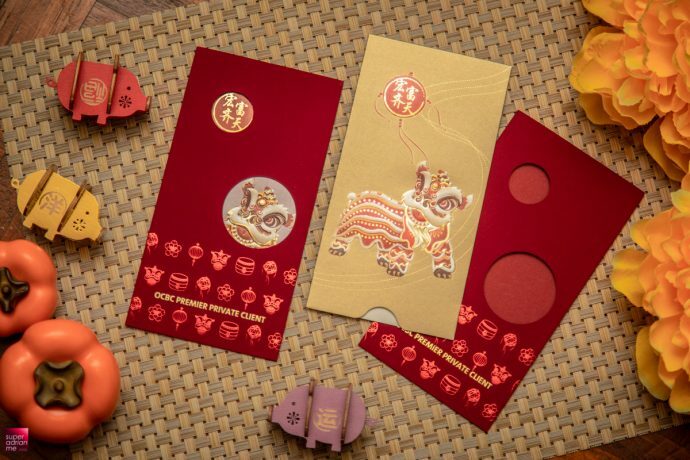 Joy to ring in good fortune with joyous gatherings and Prosperity to revel in rounds of abundant wealth and success. 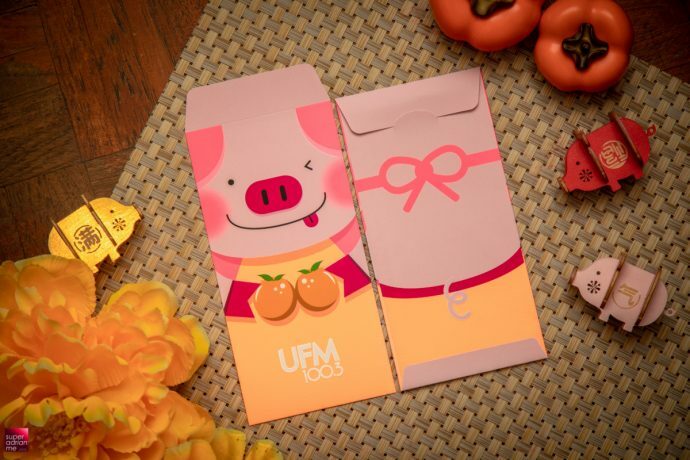 UOB has picked a landscape format so that it is easier to insert notes. 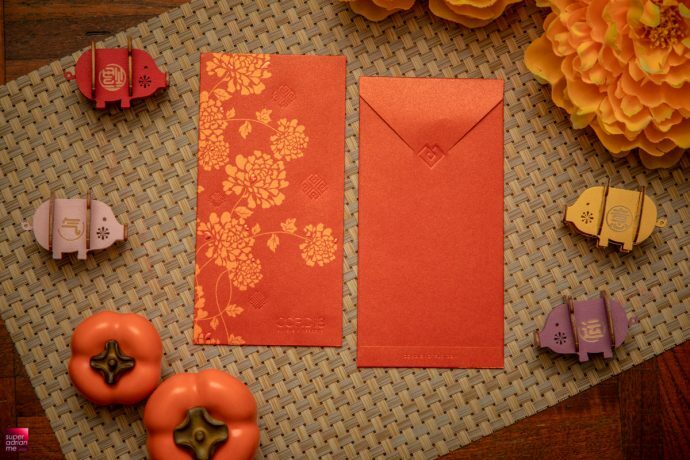 And if you measured these pretty red packets, they are 168 mm x 88 mm. 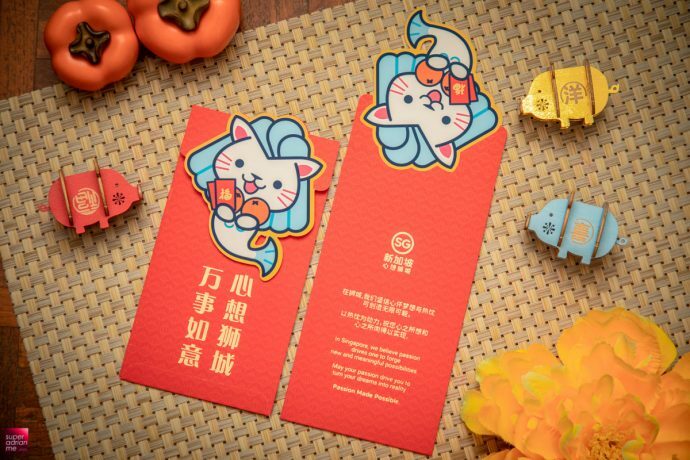 Rather auspicious. 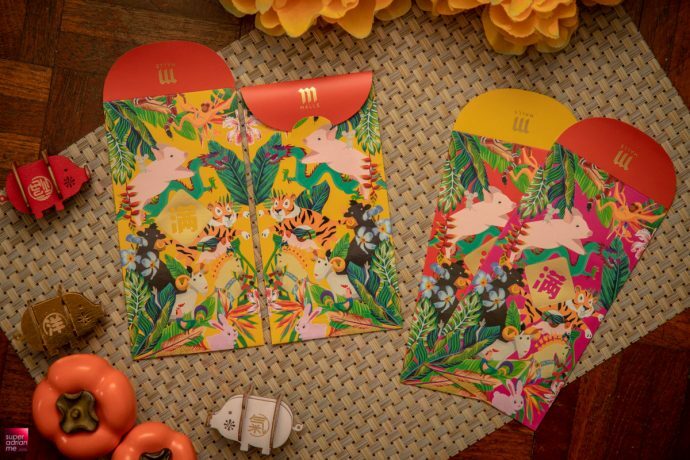 Circles are cleverly used to form this year’s zodiac animal and environmentally-friendly paper is used. 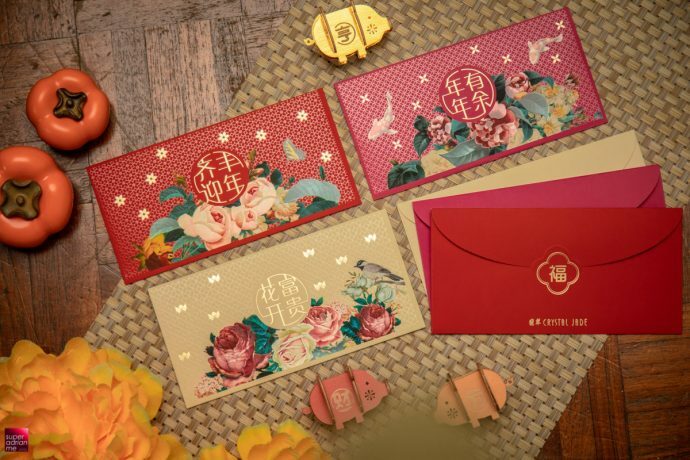 Every year we looked forward to how the various brand’s creative teams will playfully design the red packets based on the year’s zodiac animal. 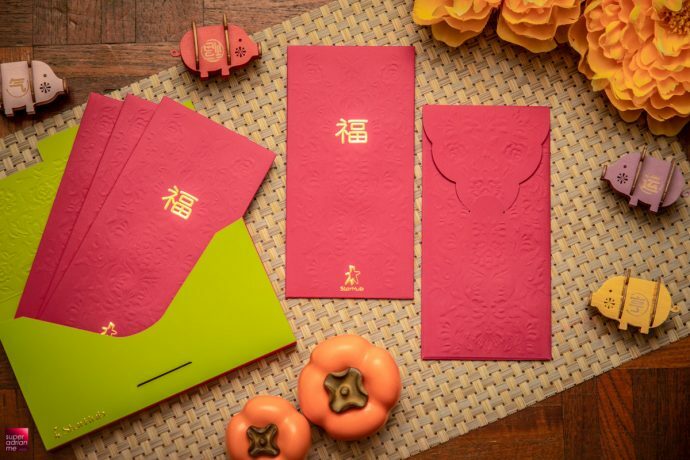 And for the year of the Pig, we are seeing more designs that are trying to make the animal less obvious. 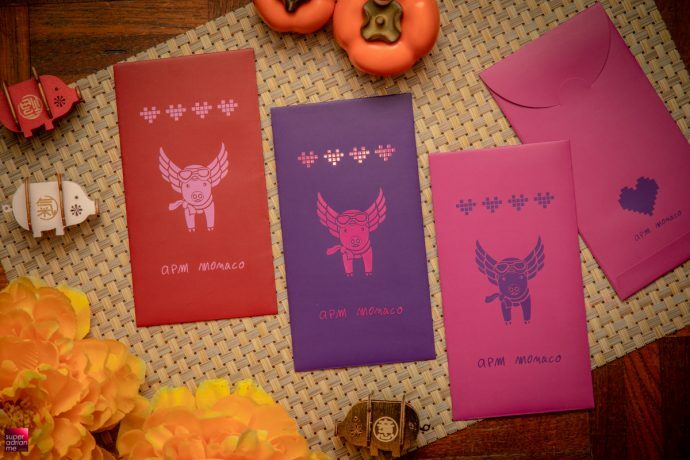 Maybe because it’s not the most hardworking animal in the zodiac. 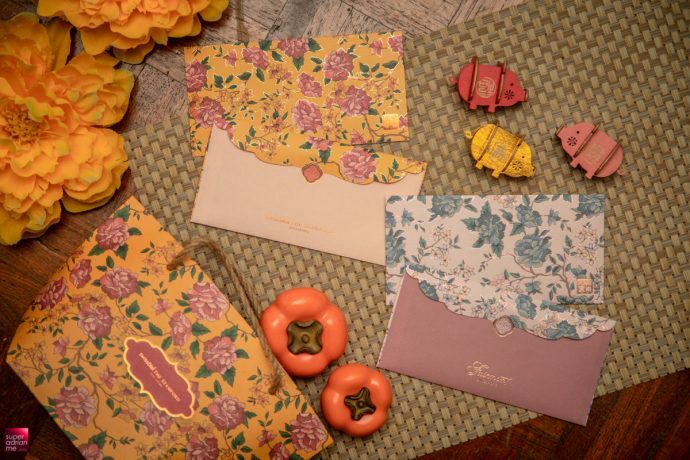 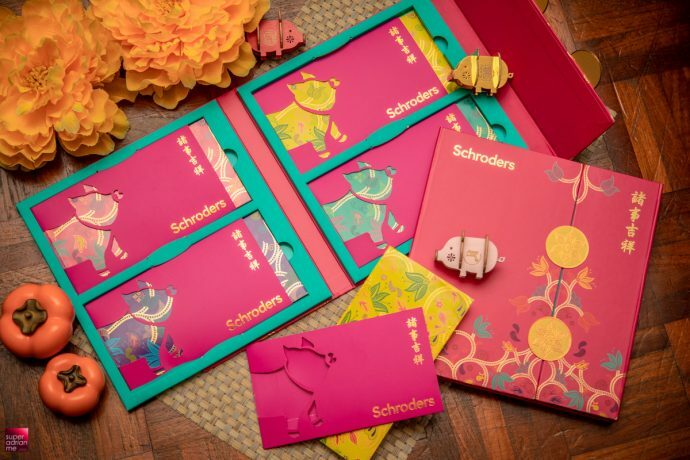 Brand and PR agency [email protected] was inspired by the traditional Peranakan culture to design this year’s red packets for global investment manager, Schroders. 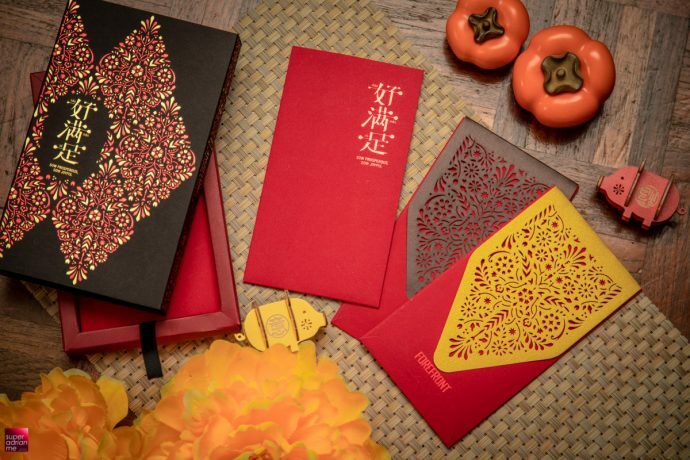 This is one of the red packets we look forward to every year, because of the beautiful design. 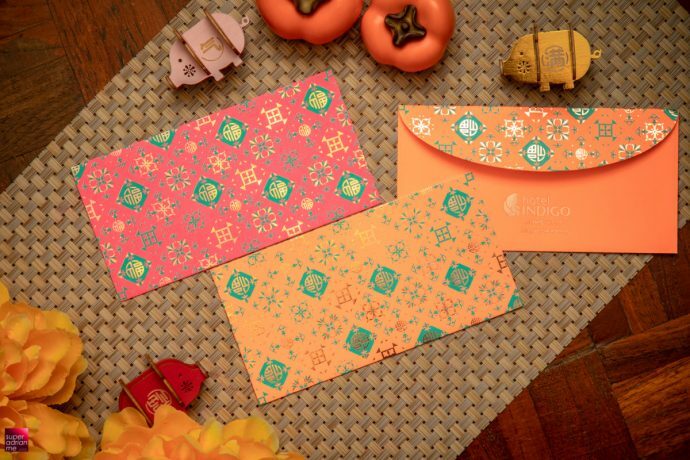 The Ang Pow holder resembles a traditional kebaya featuring bright, vivid and festive prints that bloom across the surface, signifying springtime. 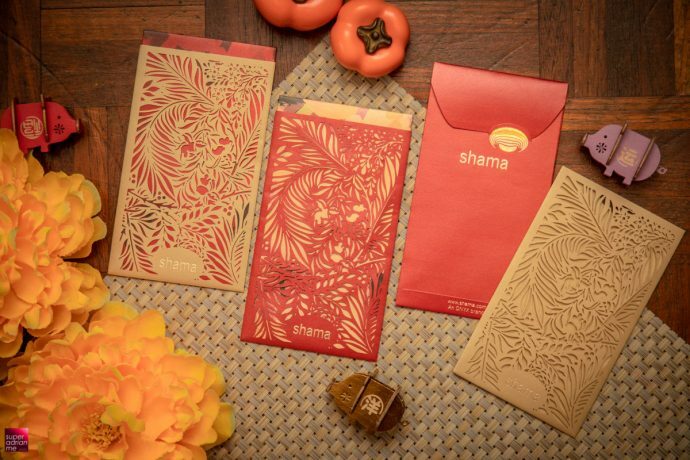 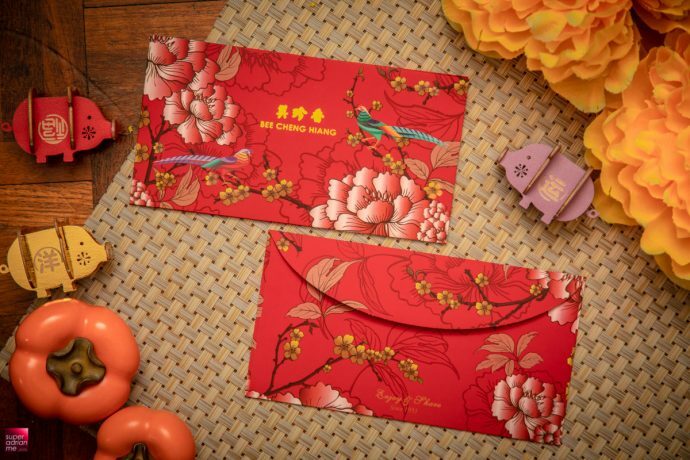 The red packet within opens up to reveal an intricate layer of floral prints. 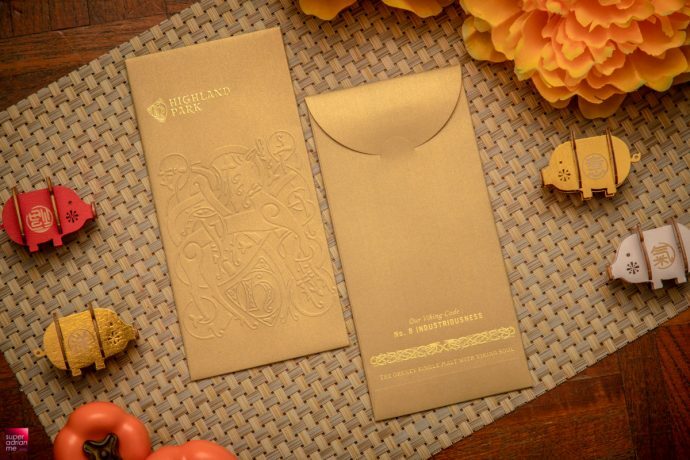 The final look is then completed with a stylised kerosang. 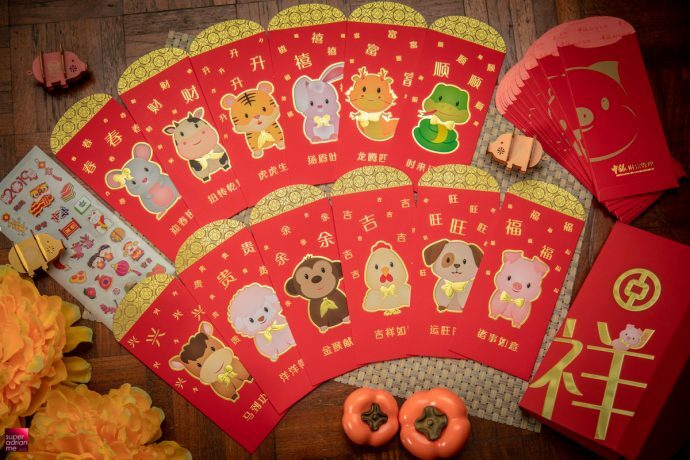 This year’s fun and creative digital element encourages participation among young and old with a digital colouring game. 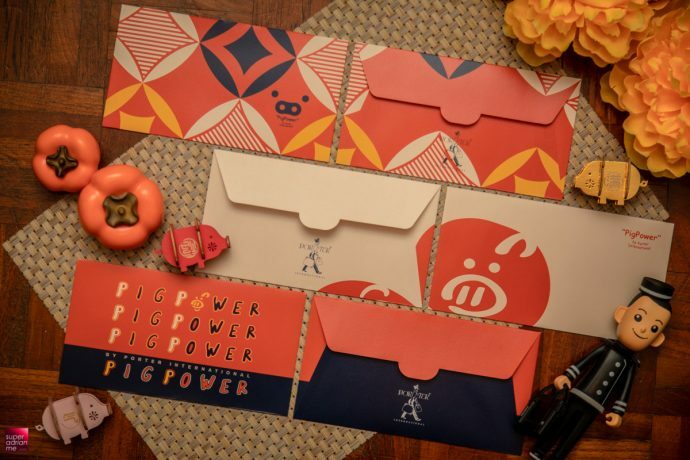 Colour and design your own piglet art for a chance to win 999 Pure Gold Peppa Pig coins before 15 February 2019. 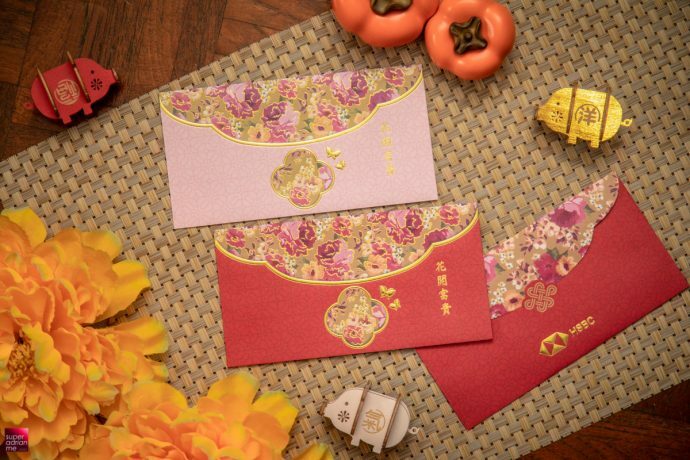 You can also save it and send to your friends and family as a personalised CNY greeting. 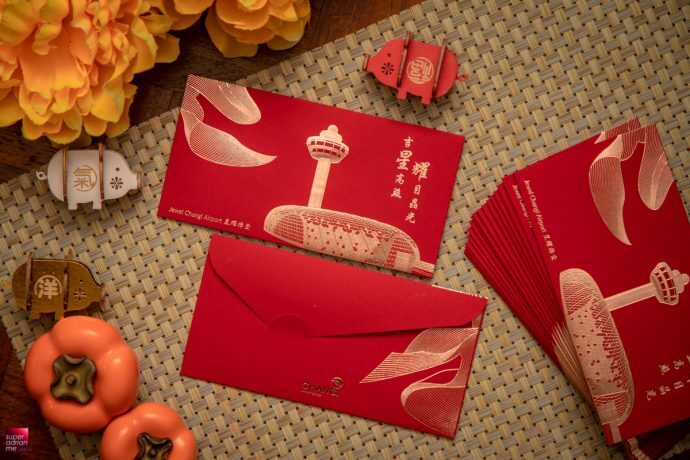 HomeAway invites travellers to book their dream family holiday before 28 February 2019 11.59pm to get an S$88 activity hong bao voucher to spend on Expedia’s activities. 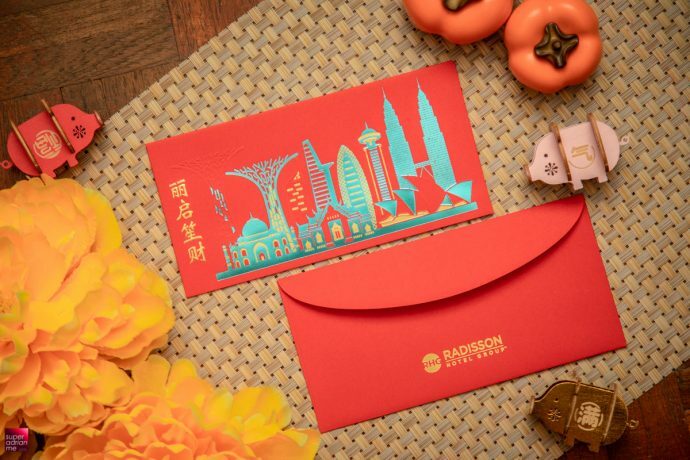 HomeAway conducted a survey of 1,000 Singaporean travellers and discovered that 3 in 4 Singaporean families said that they saw overseas vacations as a chance to spend quality bonding time together. 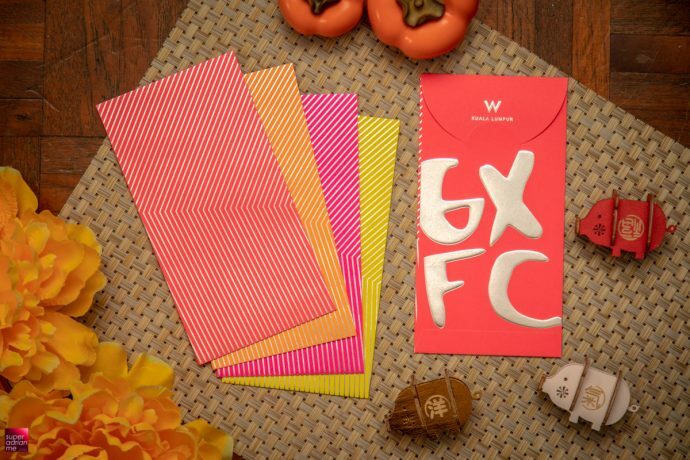 Amongst the regular holiday home users, 77% felt that staying in holiday homes help families to bond on their holiday. 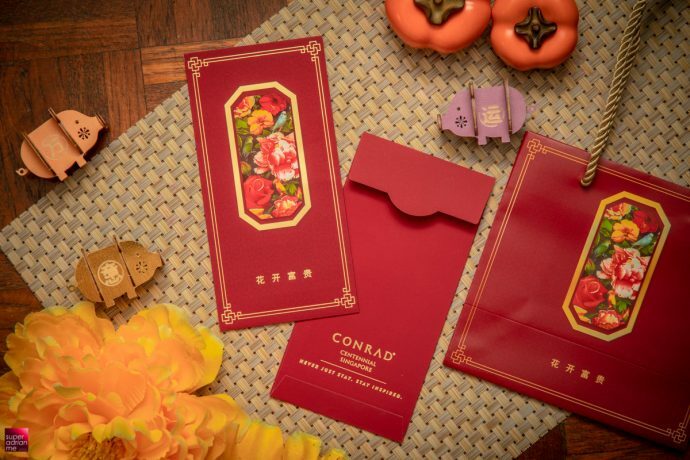 75% of respondents will opt to book a holiday home over a regular hotel as these properties were able to accommodate the whole family under one roof, with 74% indicating they enjoyed the conveniences of being a home away from home citing amenities as kitchen, laundry and outdoor space. 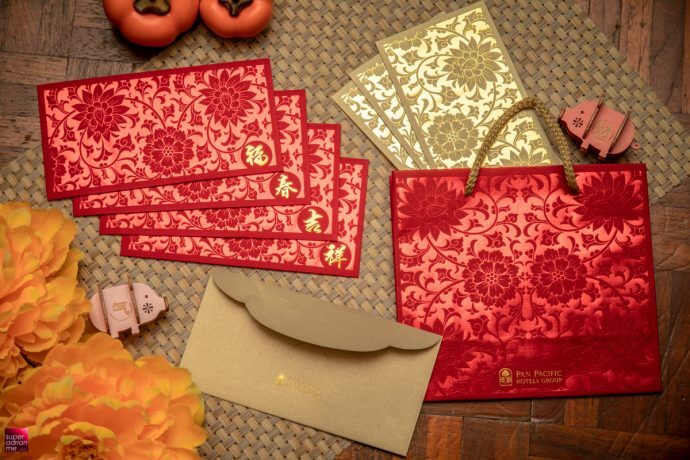 Spend a minimum of S$88 at AMK Hub or S$168 at FairPrice Xtra to get a special set of AMK Hub Prosperity Packs before 4 February 2019. 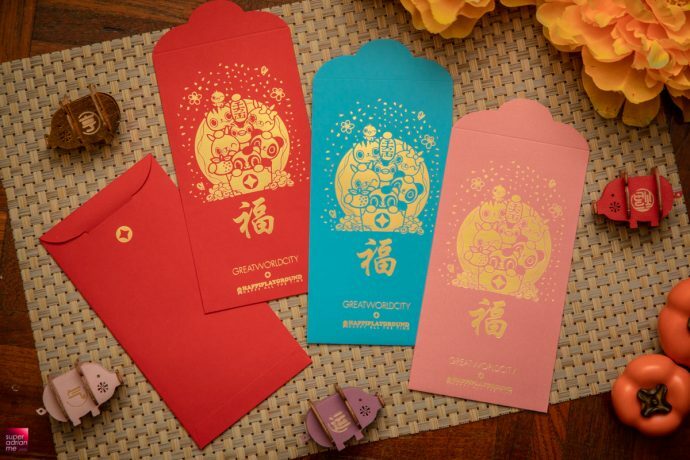 At Jurong Point, spend S$88 or S$132 at NTUC FairPrice, Fairprice Xtra and its subtenants to redeem to a set of Prosperity Fortune Bag. 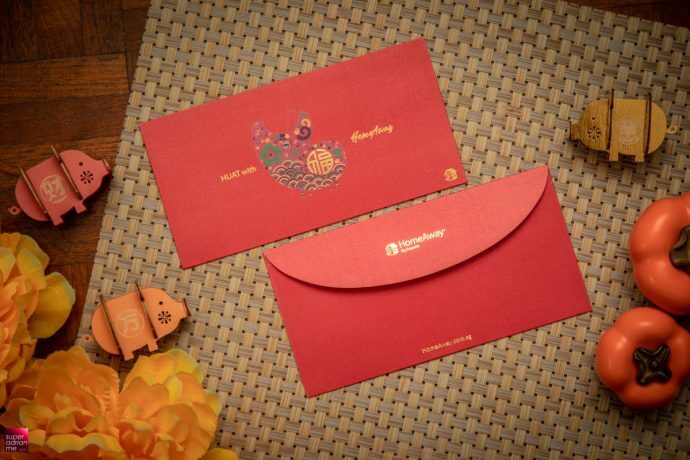 That comes with a set of 6 red packets and orange carrier. 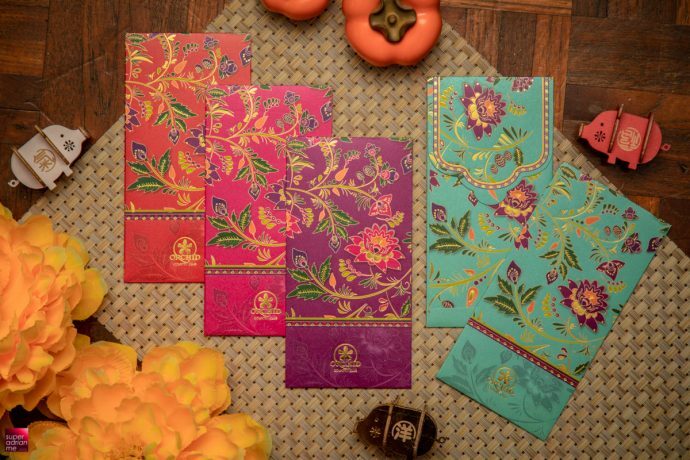 To celebrate the rich culture of Straits born Chinese, here are some designs that we think are more Peranakan~ish in design and in colours. 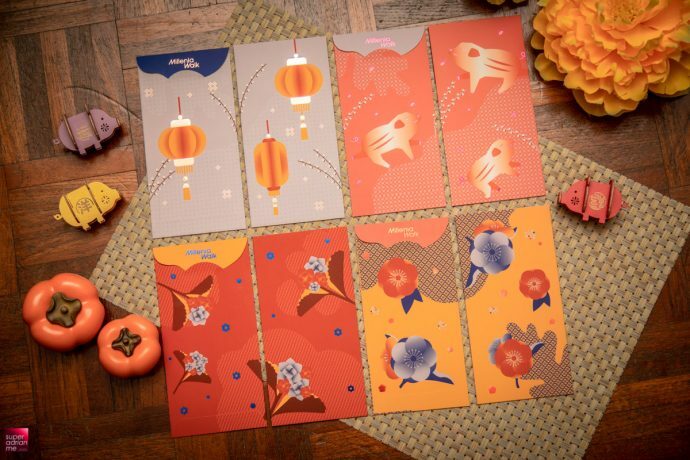 And these designs will be unique for this part of Asia. 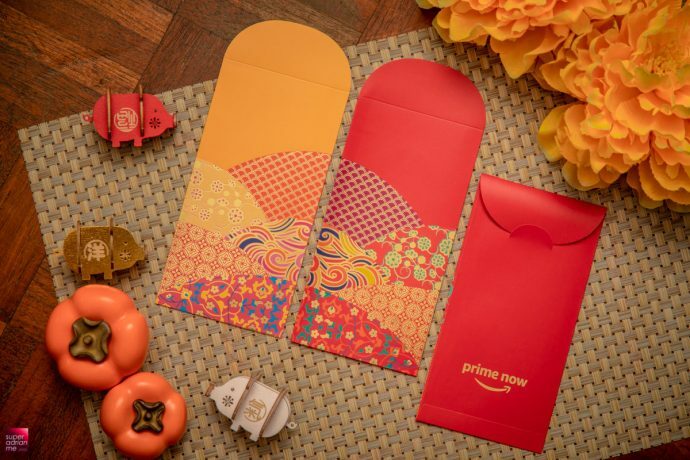 Amazon is offering free Prime Now ‘Waves of Prosperity’ Ang Pow for every Singapore order to herald the year of the earth boar. 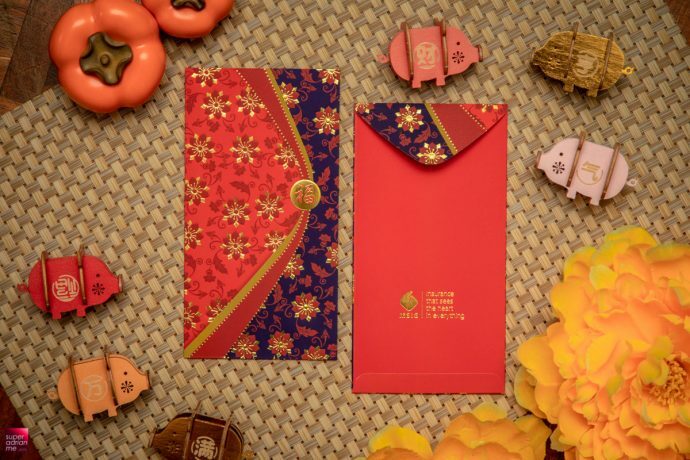 Some of these red packets are either designed as a set of matching merchandise or exquisitely designed or special artworks by artists that we think will add some meaning or stories to your collection. 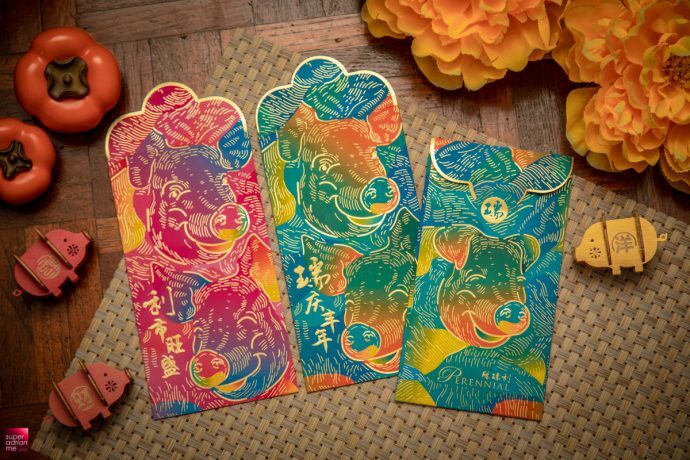 Tiger Beer is ready to celebrate the year of the pig. 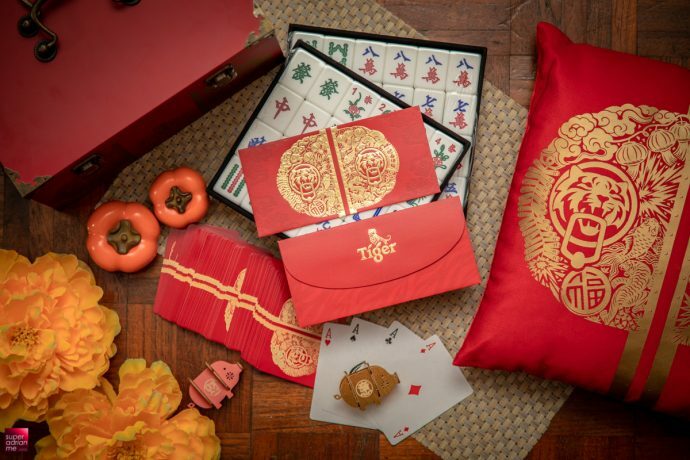 You can get a free Tiger Mahjong Set worth S$88 when you purchase S$328 worth of Tiger products before 31 January on FairPrice On. 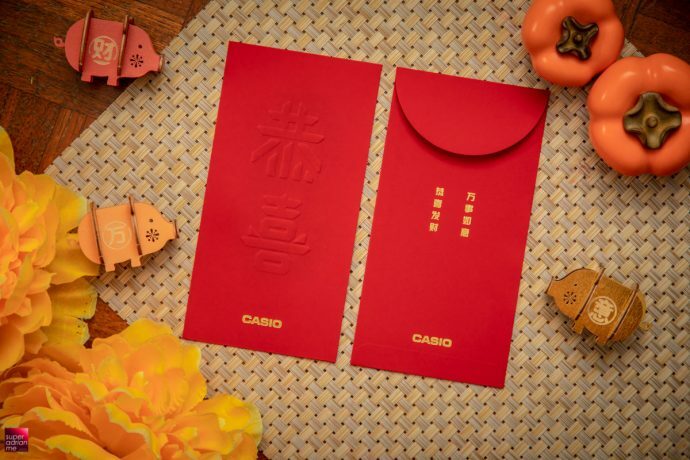 The Mahjong Set comes complete with animals and flowers as well as chips in a red wooden carry-on container so that you can gather your friends and family for a round of mahjong during the lunar new year celebrations. 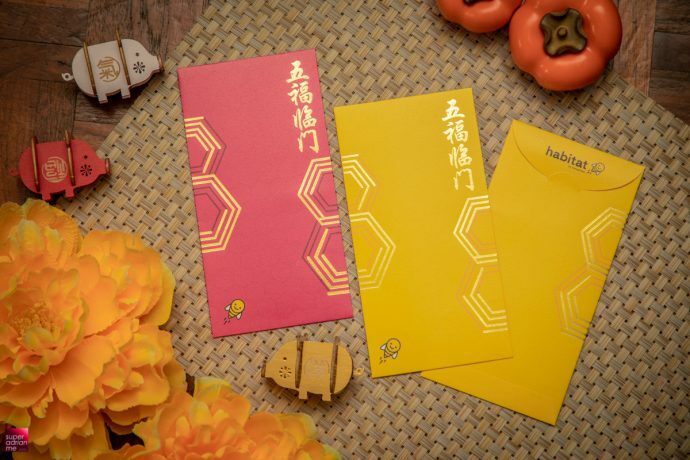 Or you can purchase 30 cans of Tiger Beer from HonestBee at S$49.90 and get a tote bag, poker cards and red packets for free. 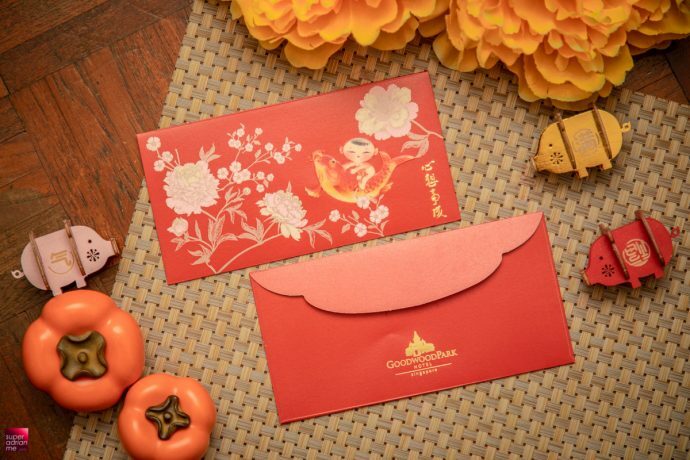 Find out how else you can entertain at home during the Chinese New Year festivities. 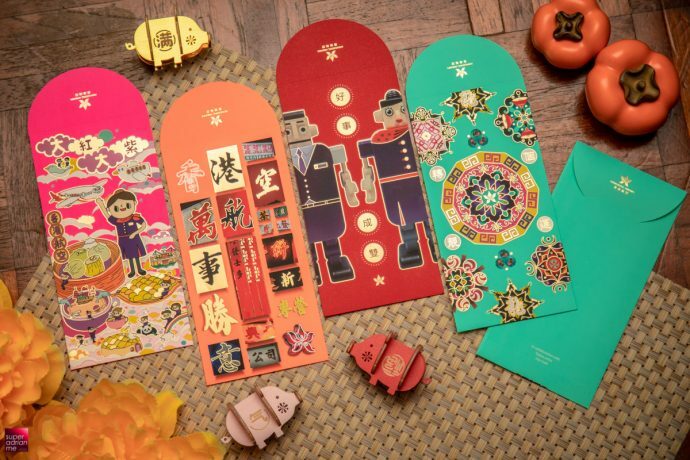 Hong Kong Airlines has collaborated with four local artists this year to work on four beautiful red packets that represents Hong Kong – a homegrown toy designer, a father-and-son signboard maker duo, an edgy tattoo artist and a local colourful illustrator. 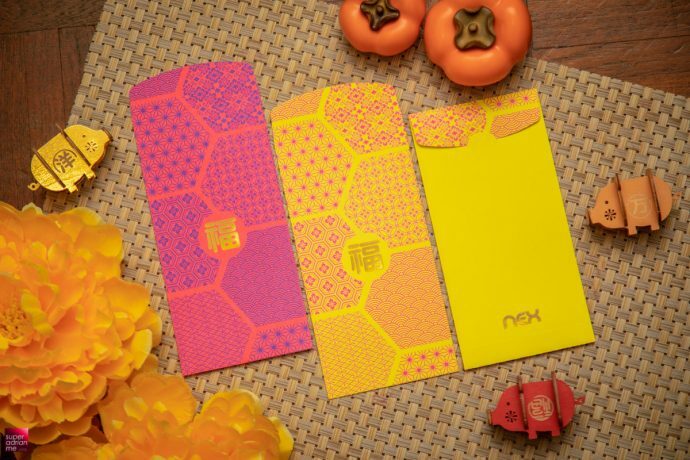 These designs truly represent #WhereHKBegins. 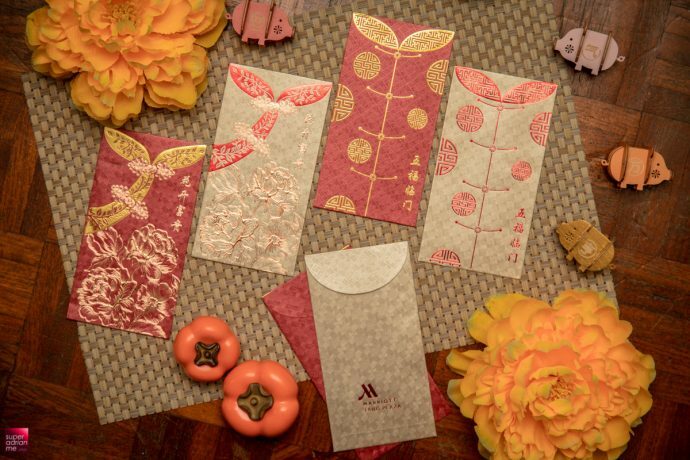 Park Hyatt Beijing celebrates its tenth anniversary with this year’s charity red packets featuring four iconic art pieces in the hotel including “Memories of Jiang’nan” on the refurbished level 63 hotel lobby. 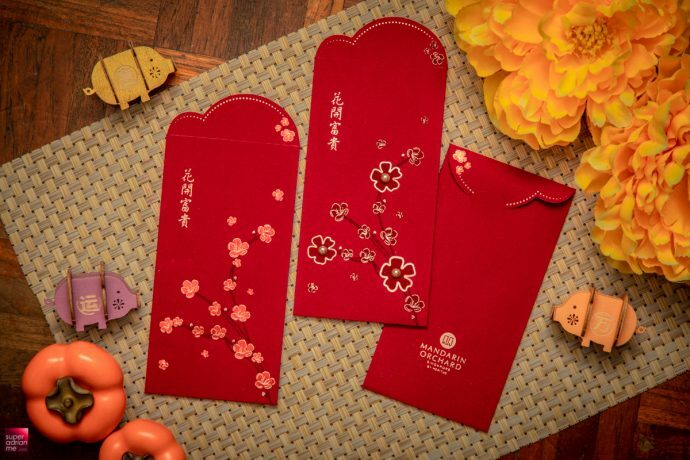 For CNY80, you can help drive donation for Renyuyuan Learning House, Park Hyatt Beijing’s long time charity partner. 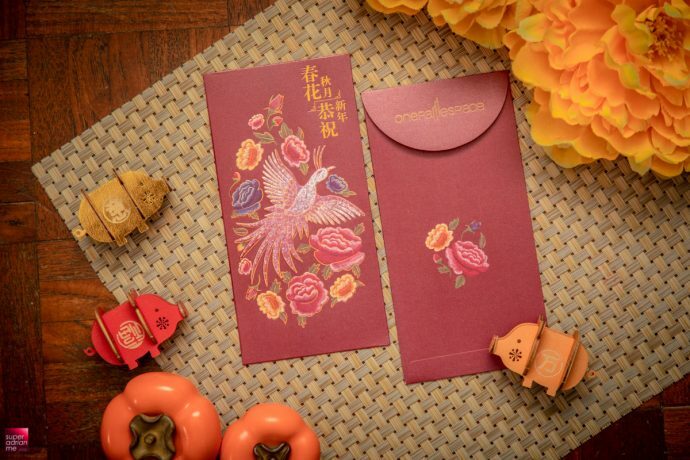 All sales proceeds go towards the education and training of disabled orphans within the area, as well as those with difficult situations or special needs. 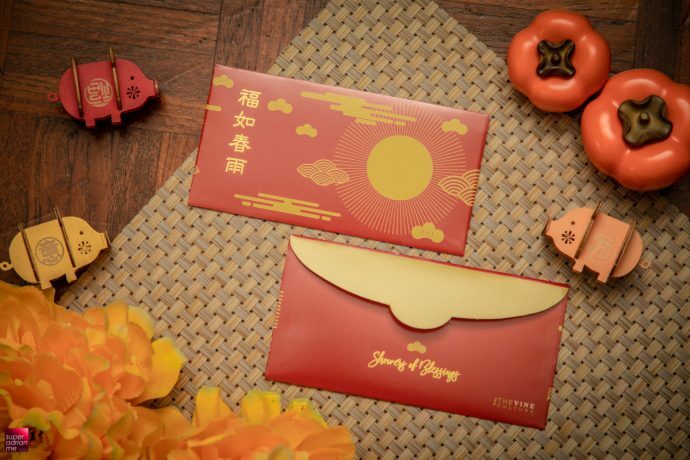 Here are some red packets where you can find traces of Singapore in them. 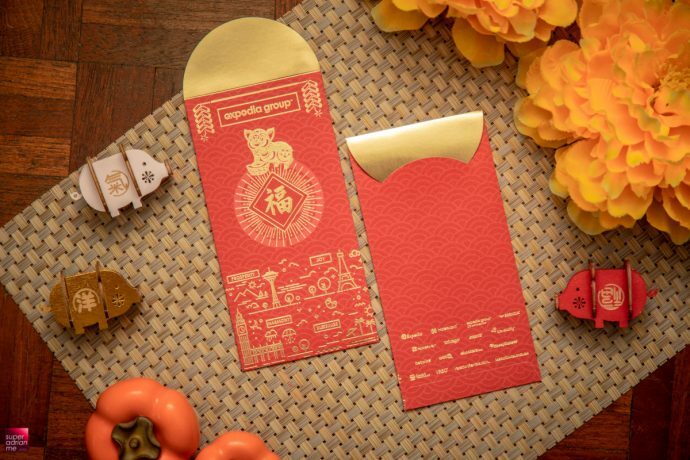 Best to give it to friends from overseas so that they have a souvenir to remember the moments celebrating Chinese New Year while in Singapore. 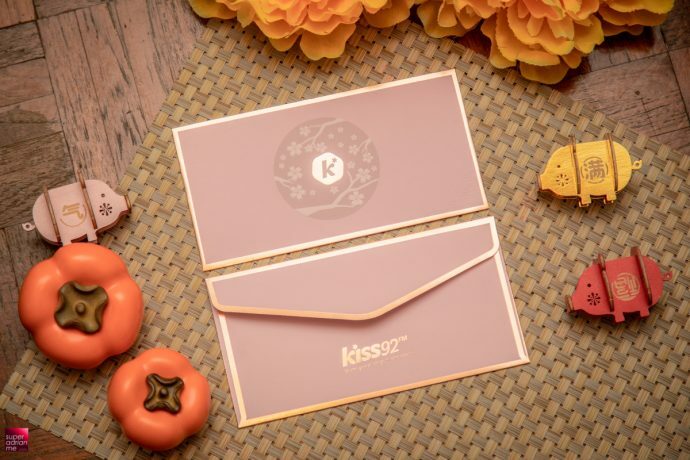 Jetstar has created the Couple-ator, a fun tool designed to recommend couples the perfect destination for the next getaway and put love back in the air. 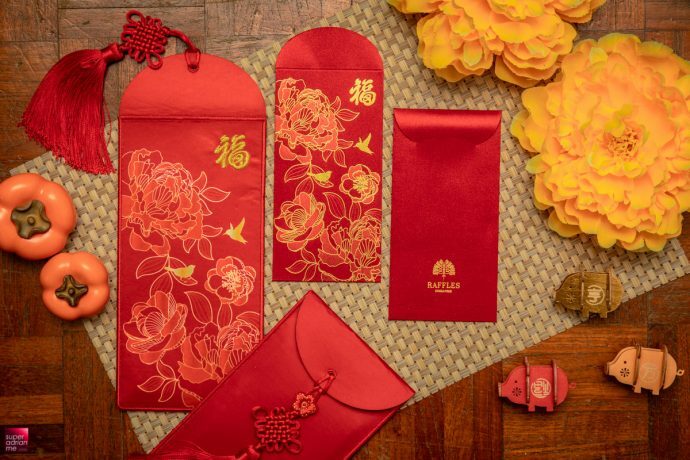 You have until 28 February 2019 to stand a chance to win a pair of free return flights and two nights’ accommodation to your Couple-ator destination. 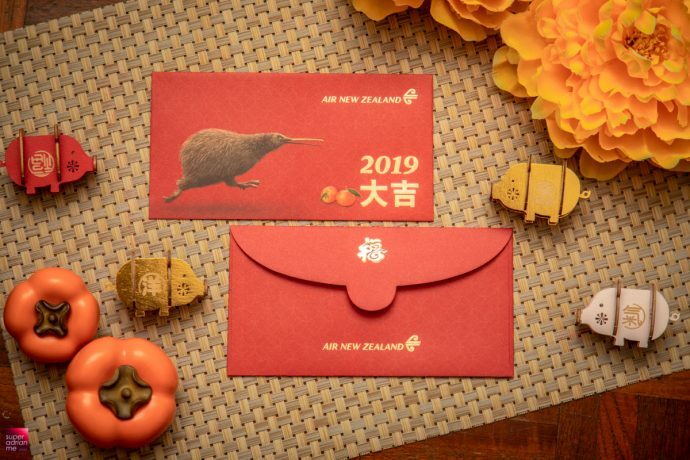 Take a quick quiz at https://love2fly.jetstar.com/ and share your destination on Facebook. 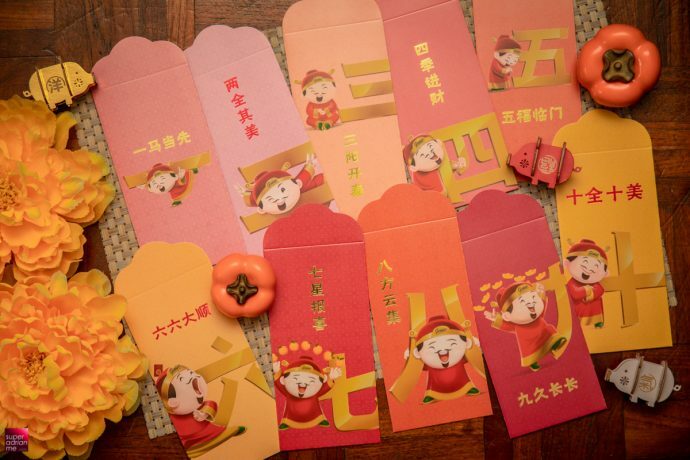 Tag @Jetstar Asia and #JetstarLove2Fly. 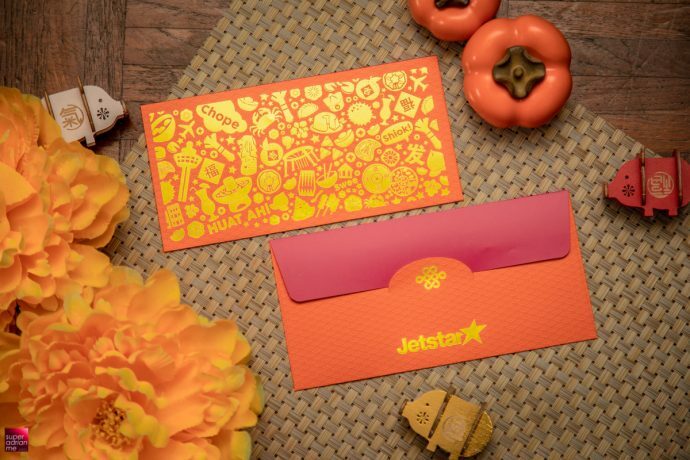 You need to convince Jetstar why you two deserve the ultimate bae-cation. 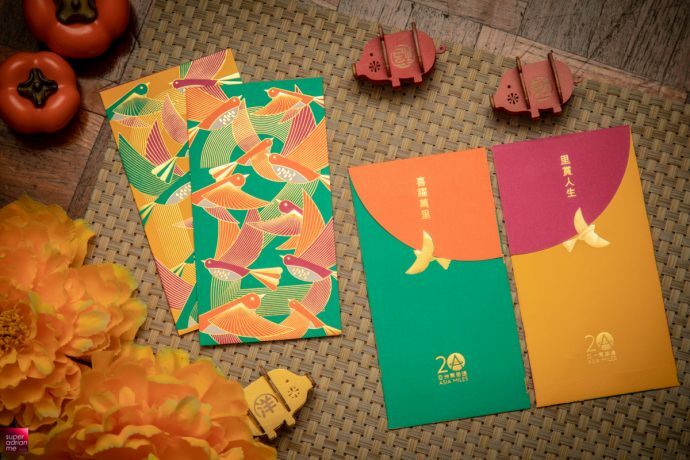 Old Chang Kee launches a Hainanese Chicken Rice’O as it debuts the Old Chang Kee Heritage Puff Series. 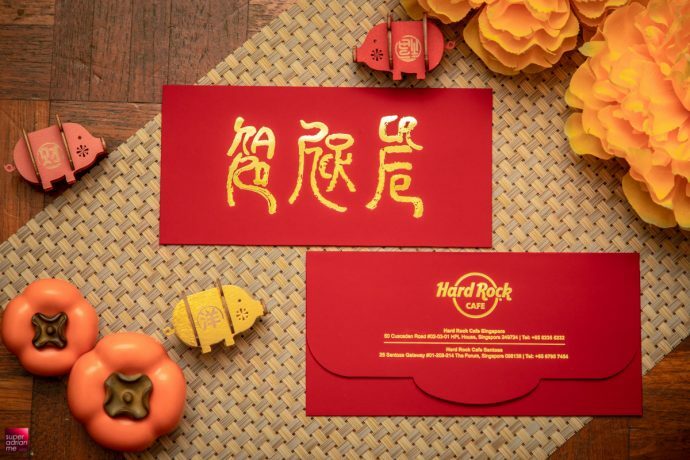 Available till 28 February 2019, enjoy chunks of steamed boneless chicken with coriander leaves, garlic and shallots and a dash of Old Chang Kee Hainanese Chilli sauce and dark soy sauce. 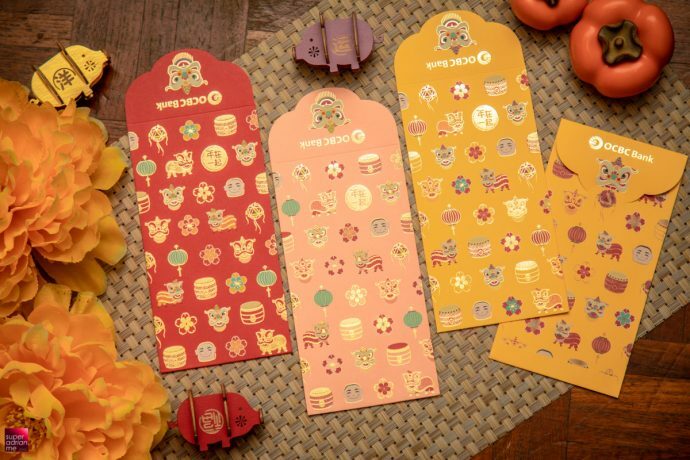 Pick up a jar of Curry cookie or the Nasi Lemak cookie at S$16.80 each from Old Chang Kee and Curry Times. 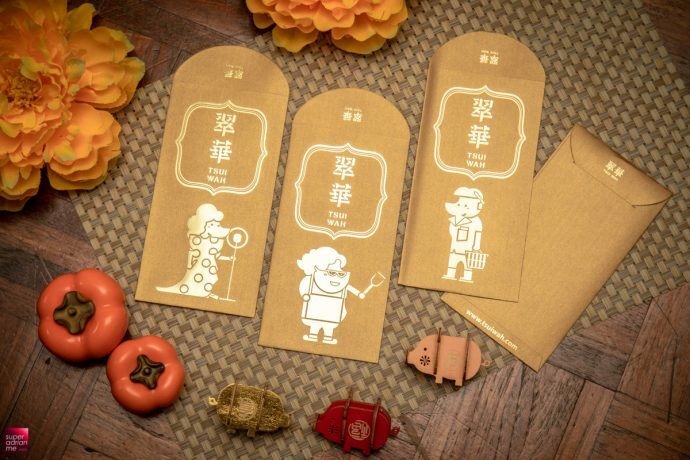 Entertain your guests with homemade chilli sauces priced at S$5.80 such as Hainanese Chilli, Nasi Lemak Chilli and Homemade Sweet Chilli and Curry, Laksa or Chilli Crab pastes created in collaboration with Miss Tam Chiak. 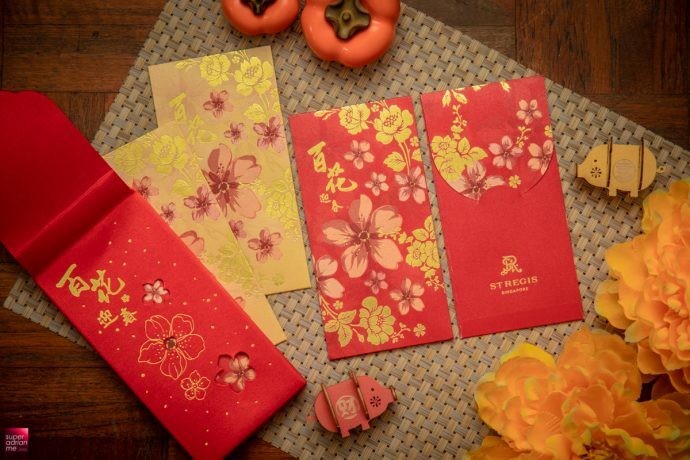 For Chinese New Year, it’s usually the kids that are excited to receive red packets from the adults. 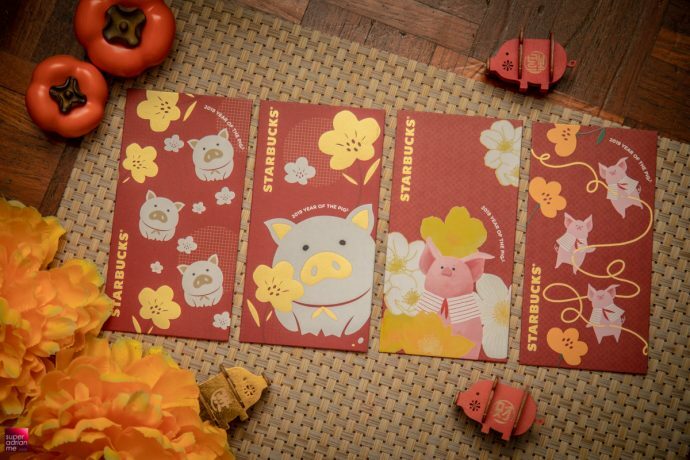 So cute ang baos are essential to gather some attention from the kids and like minded adults too. 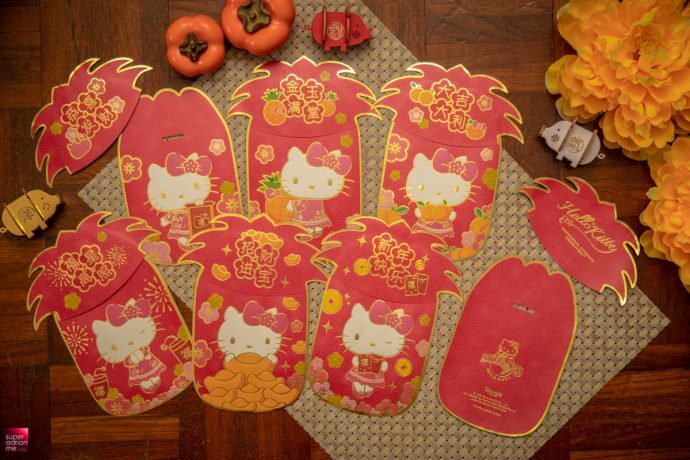 Goldheart has produced an exclusive set of Sanrio Character red packets this year. 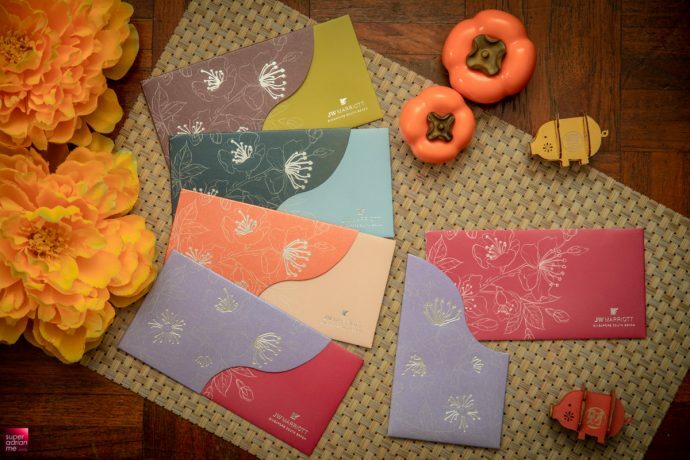 They are available as a gift with purchase for every S$500 spent up to a maximum of four packets per customer. 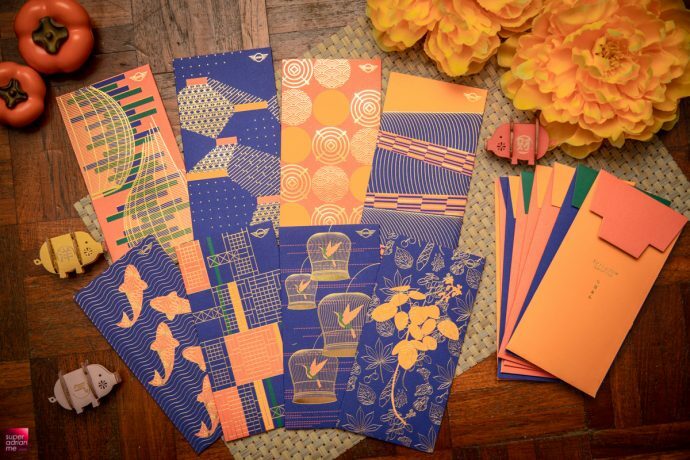 The set consists of eight different designs and is available till 28 February 2019. 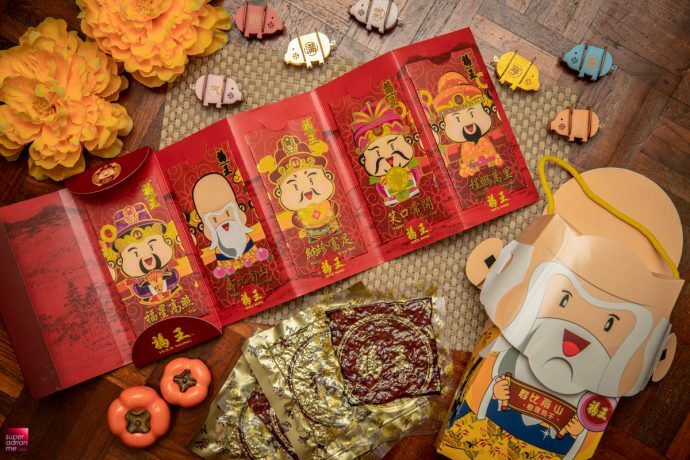 Hock Wong debuts its bak kwa with a series of absolutely cute packaging featuring cut-out caricatures of mythological Chinese Gods of luck, blessing, fortune, longevity, happiness and fortune. 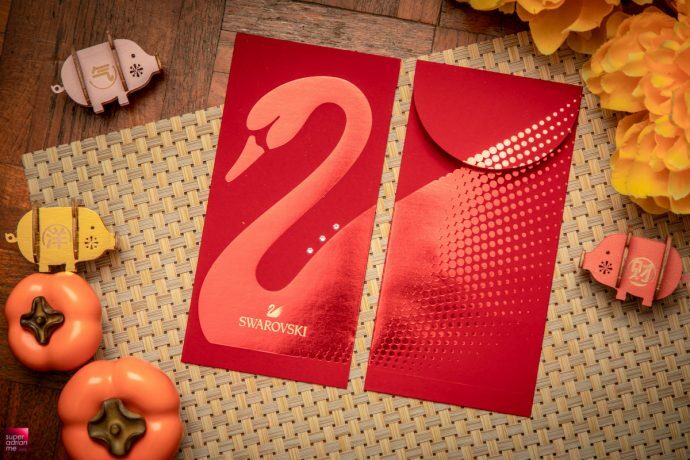 Impress your mother-in-law and parents. 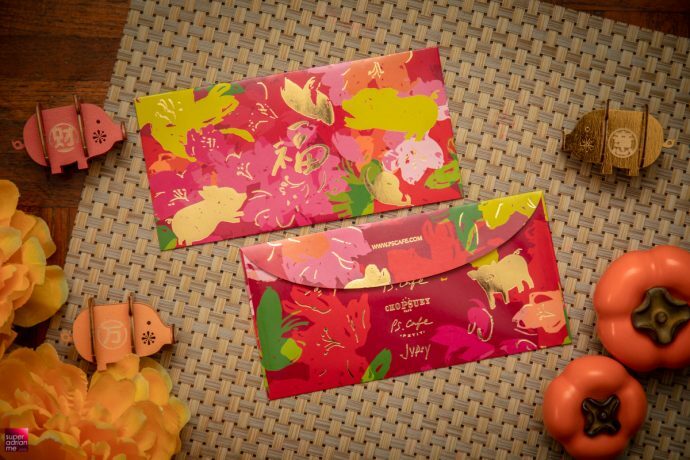 Available online at www.hockwong.com.sg or eight pop-ups around Singapore. 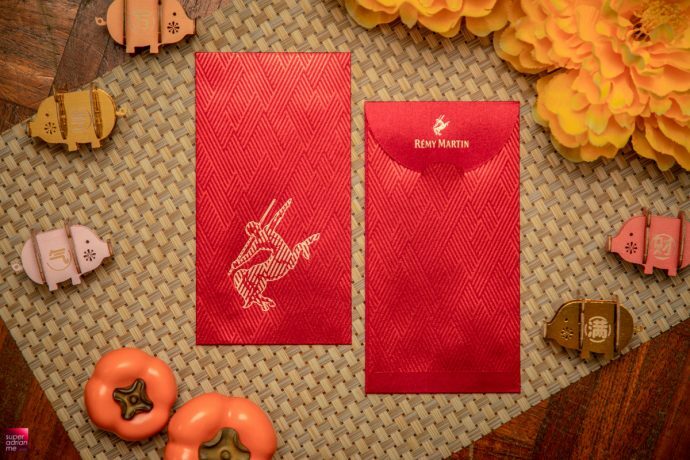 Purchase the five-in-one collection gift set with Minced Pork Bak Kwa and get a limited edition set of red packets with matching designs for each mythical Chinese God. 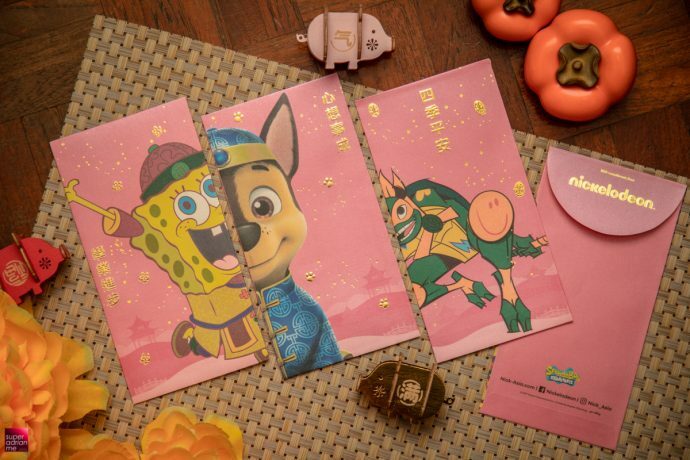 Too adorable. 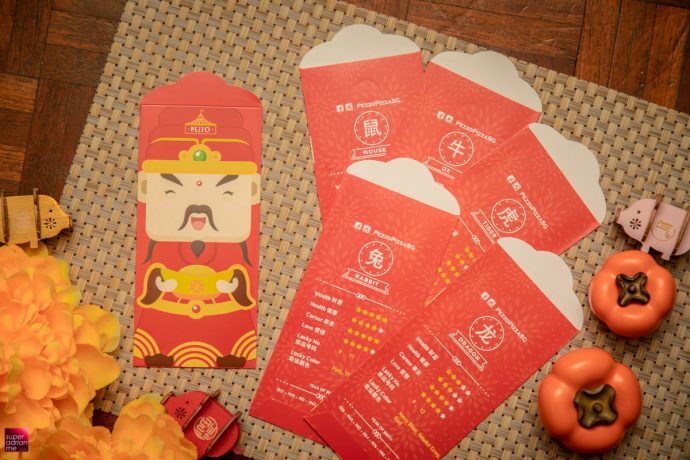 DBS pilots world’s first loadable QR red packets. 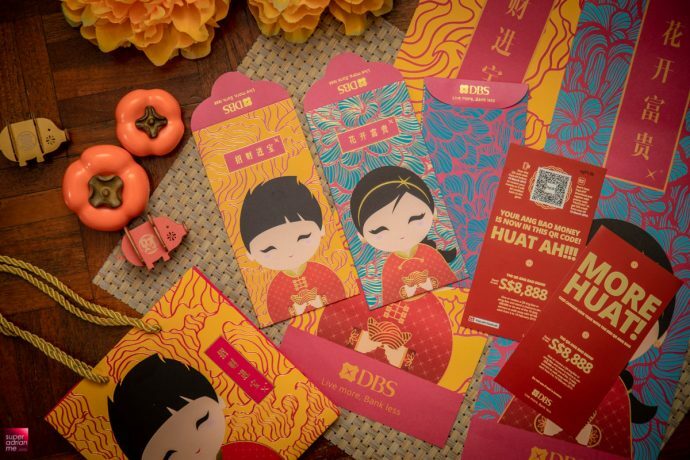 The DBS QR Ang Bao allows DBS PayLah! 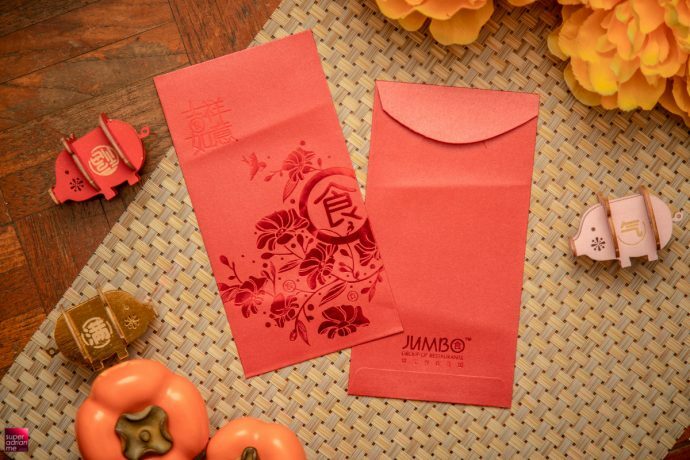 users to preserve the traditional act of giving and receiving physical red packets while eliminating the use of cash. 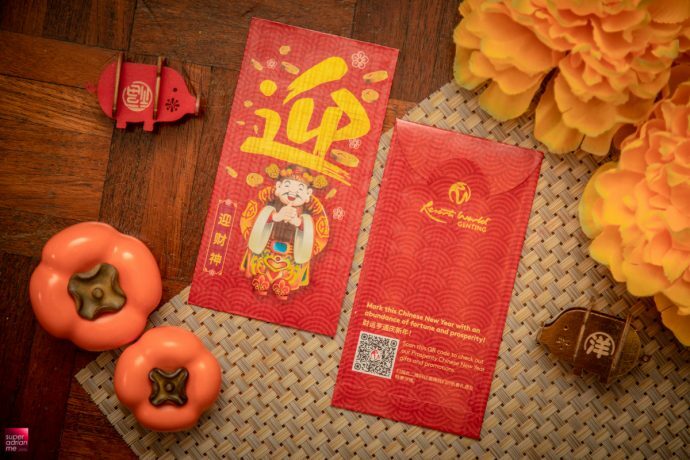 Load your desired cash values of up to S$99 onto unique QR codes and gift it to your family and friends. 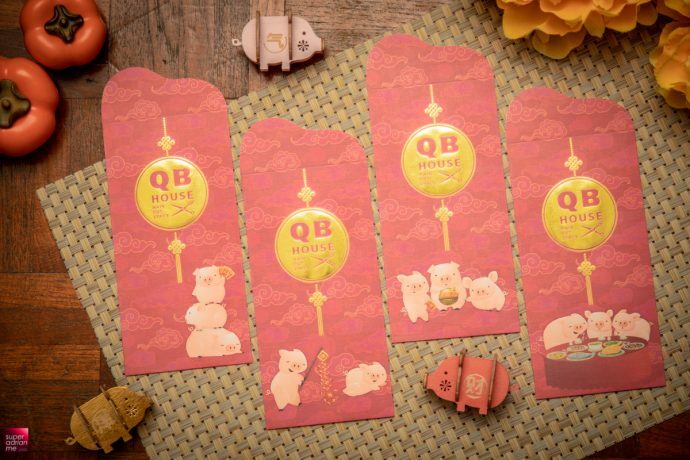 They can scan the QR code with their own DBS PayLah! 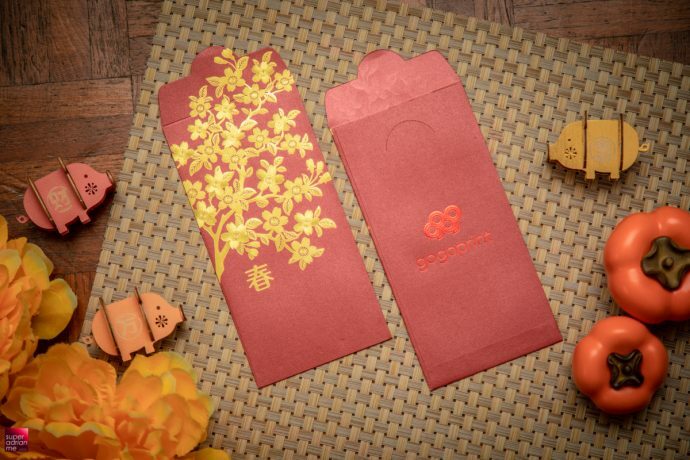 app to receive the loaded amount. 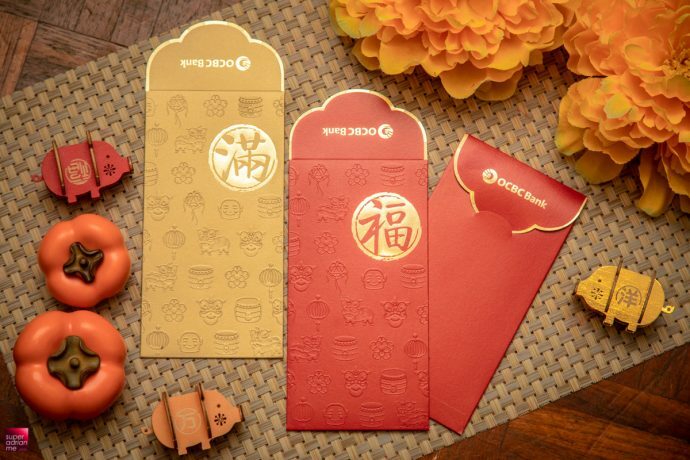 Every Ang Bao comes with a unique QR code and serial number for added security. 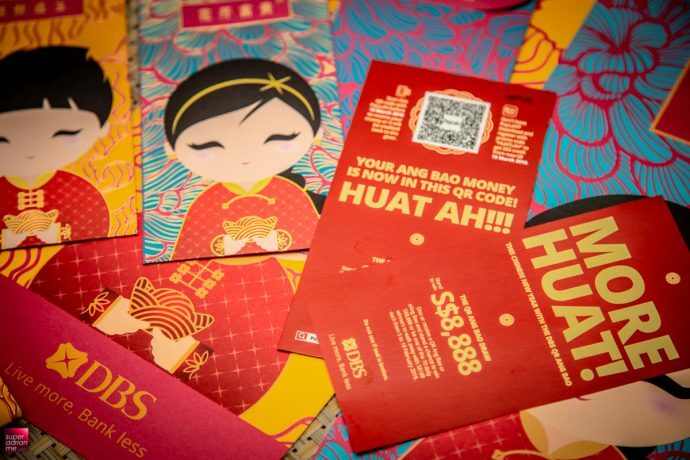 You can easily cancel a particular DBS QR Ang Bao’s loaded funds via the DBS PayLah! 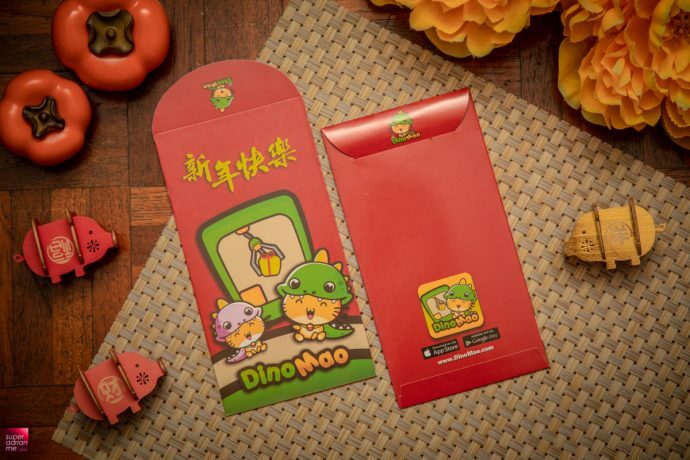 app in the even that it gets lost or stolen. 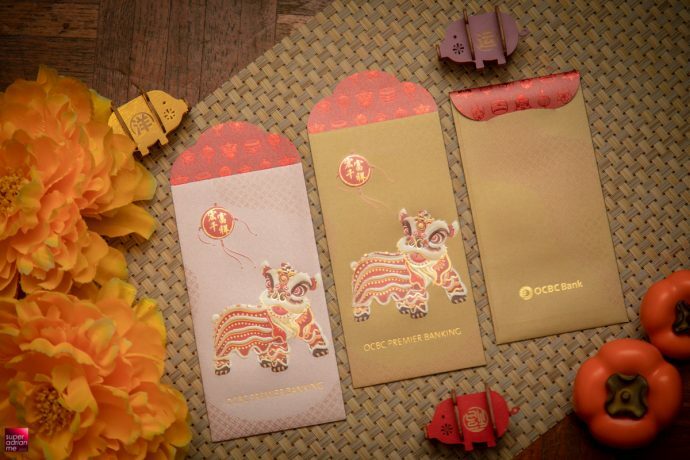 These DBS QR Ang Baos are valid for use from 25 January 2019 to 15 March 2019. 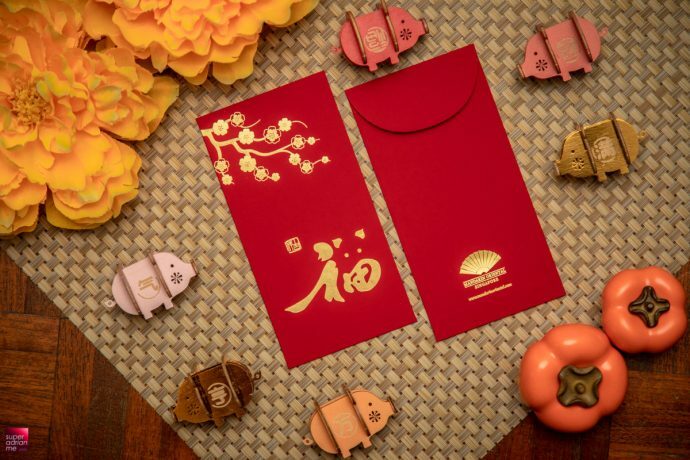 Funds not redeemed by 15 March 2019 will be refunded to the givers. 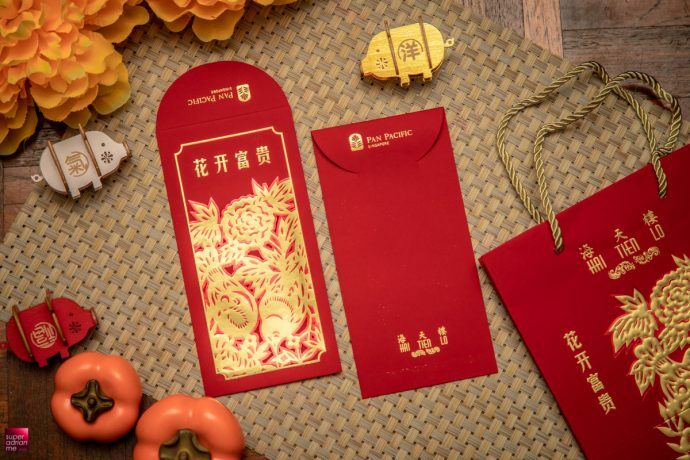 Limited quantities of DBS QR Ang Baos have been distributed since 25 January 2019 at 95 DBS/POSB branches or POSB Pop-Up ATMs islandwide. 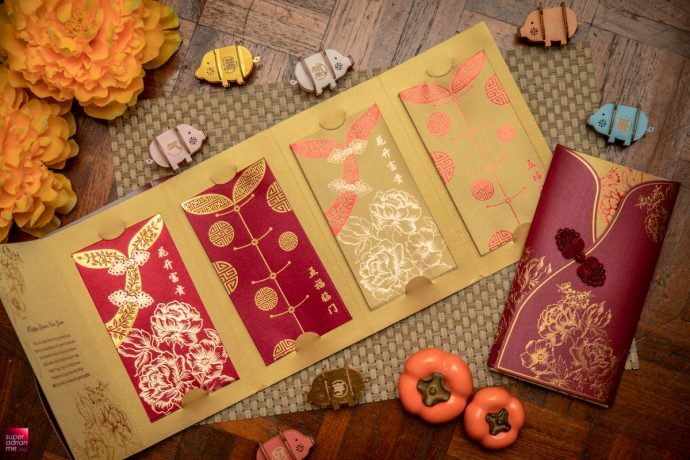 Singapore Chinese Cultural Centre has commissioned local illustrator Lee Kow Fong who is popularly known as Ah Guo to design this year’s limited edition red packets. 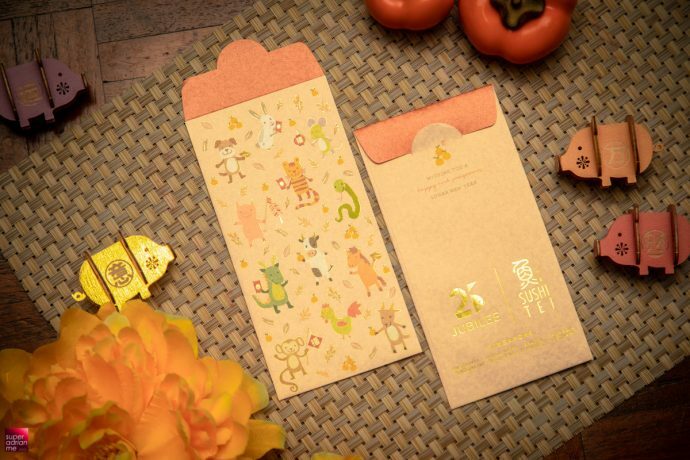 The artwork features Lee’s signature animals including the hedgehog, penguin and rabbit, new year flowers, mandarin oranges. 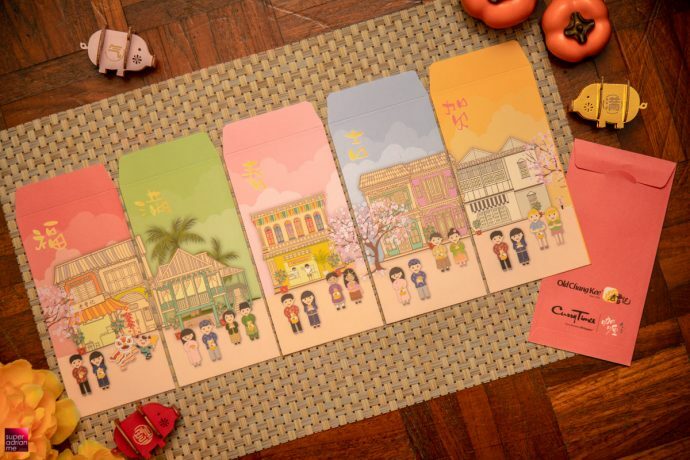 Lee has also illustrated tiles with traditional Peranakan floor tiles for a more local flavour. 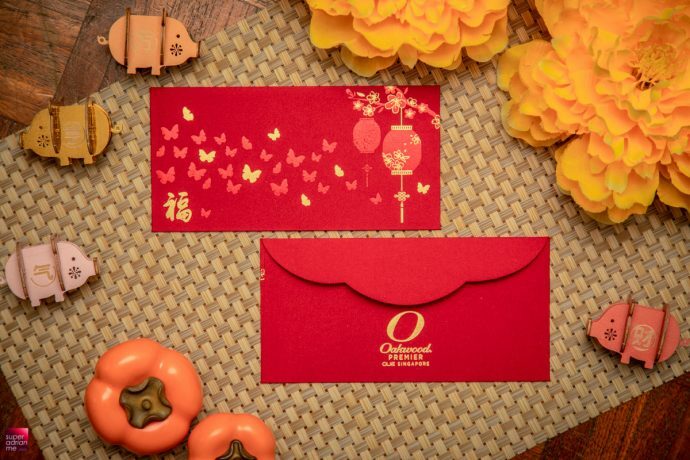 Ah Guo worked with Singapore Composer and Pianist Peng Chi Sheng to compose The Lo Hei Song. 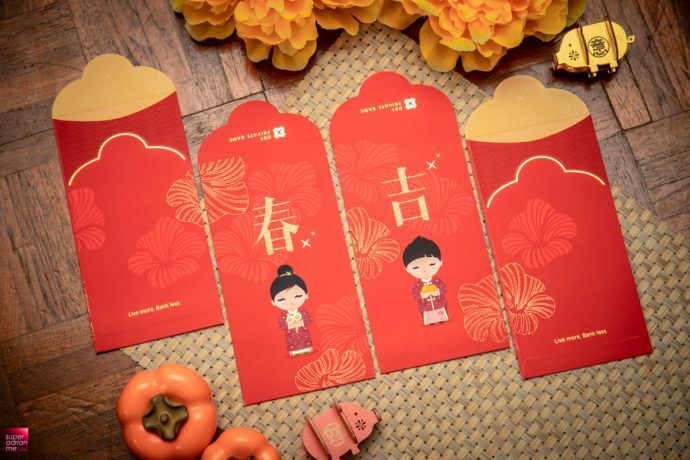 Peng sang the song with Tay Sia Yuen and Aaron Matthew Lim for SCCC’s first “Singing Red Packet”. 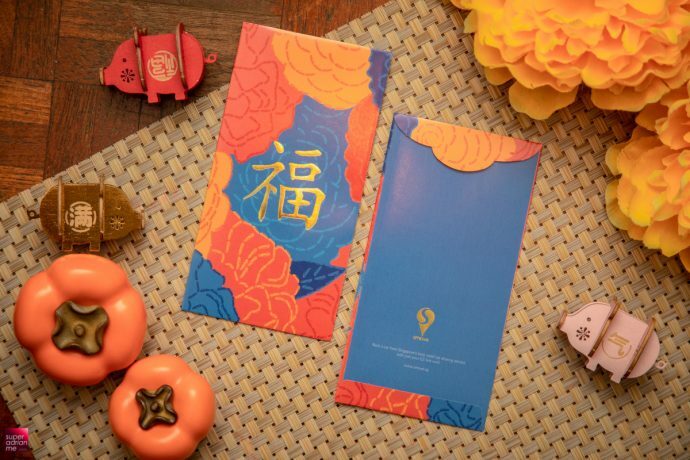 This initiative pays tribute to the Singapore Chinese culture of the popular new year dish yusheng. 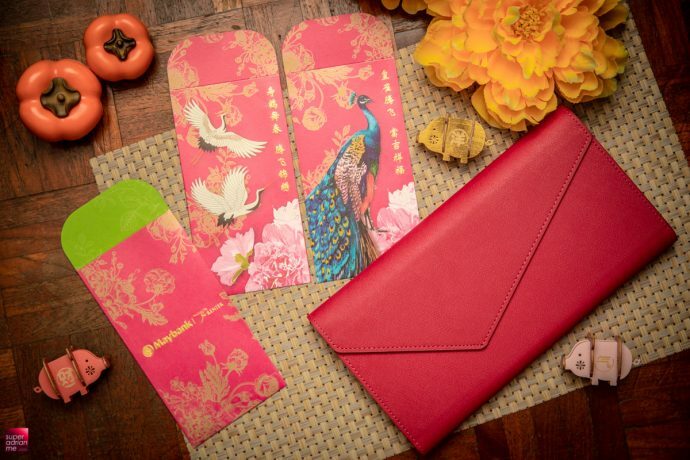 The son is modern yet retains the feel and spirit of the Chinese New Year. 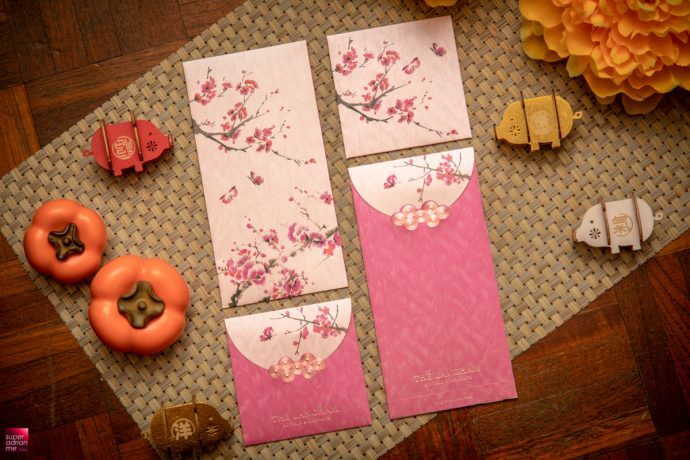 Listen carefully and you may pick out the sounds of Chinese instruments such as the erhu and tiqi. 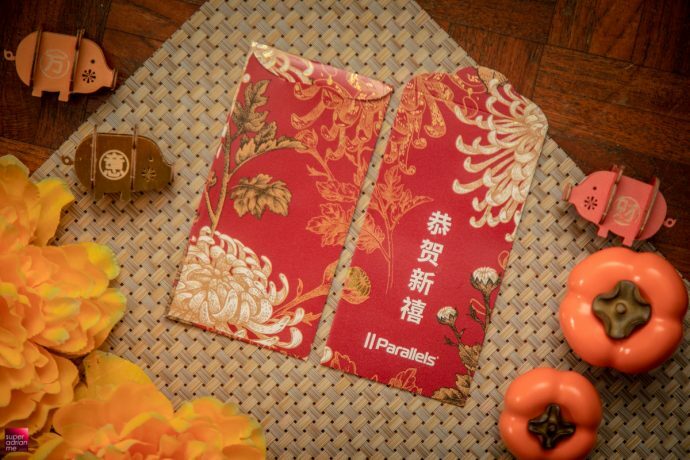 Backup harmony in chromatic scales gives the song more upbeat and fun. 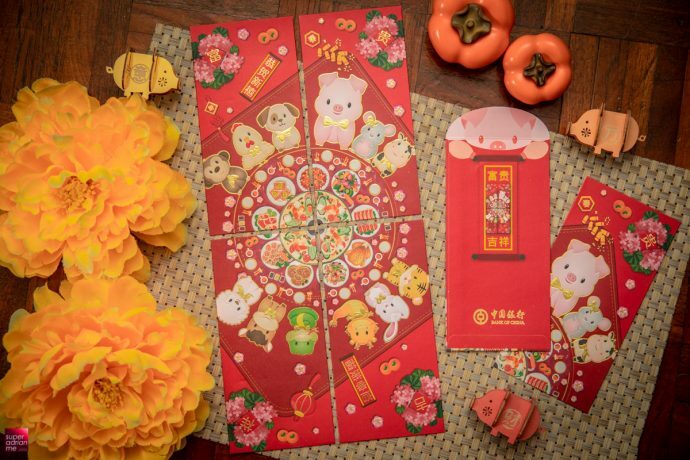 Visit SCCC’s Facebook Page to listen to the catchy song. 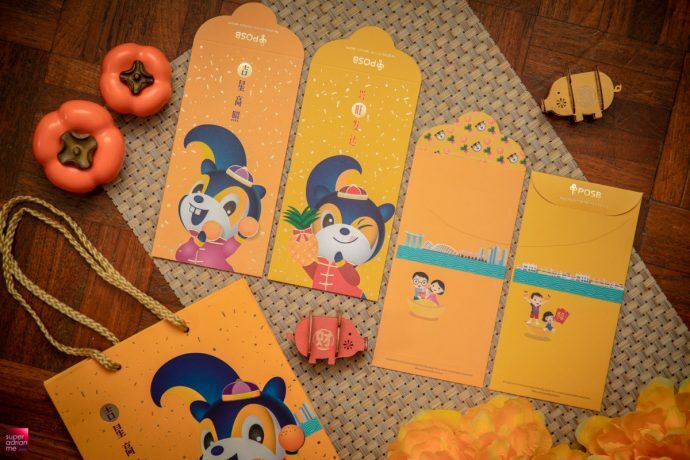 Ah Guo’s colourful illustrations are on display till 7 February 2019 from 10am to 8pm at his “So Much Fun” special exhibition at the SCCC Kwan Im Thong Hood Cho Temple Gallery on level 2 of the Singapore Chinese Cultural Centre. 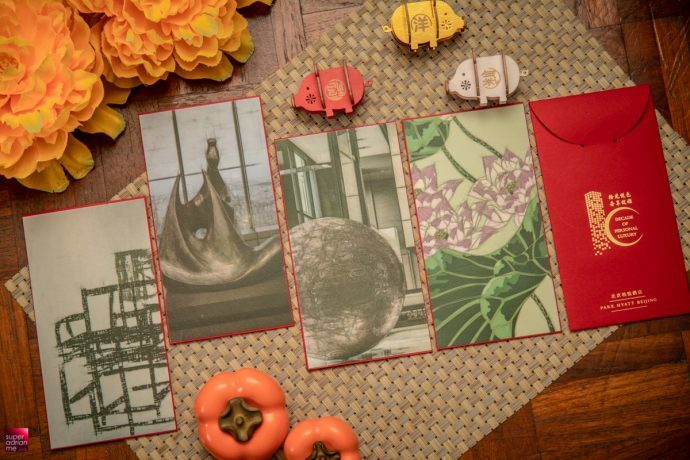 Do note that the exhibition will be closed on 5 and 6 February 2019. 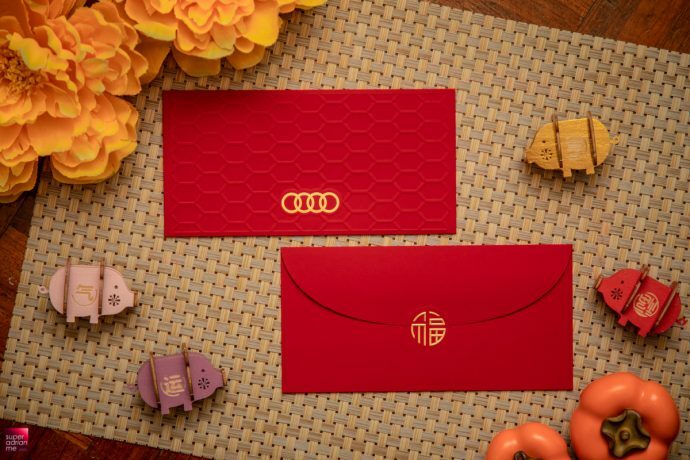 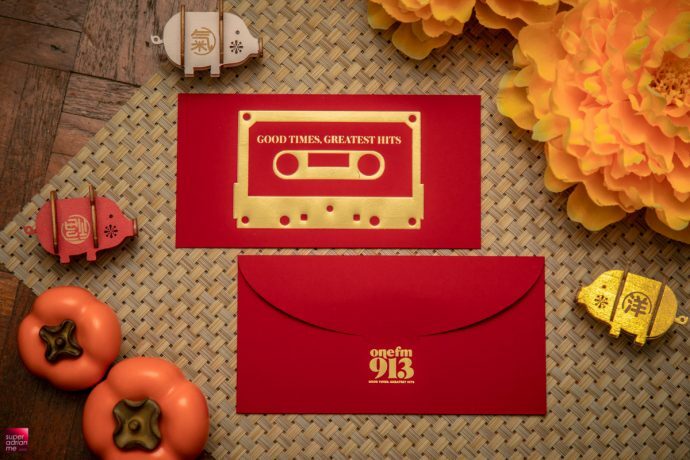 To make your red packets to stand out from the crowd, here are some designs that are fun to play with like ORIGAMI, or comes with a quirky quote that might leave a smirk on the receiver’s face, or just a design that is not like your regular ang baos. 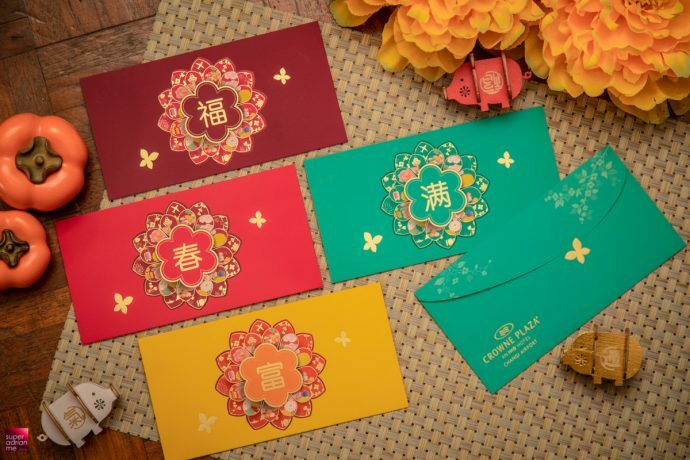 Thye Moh Chan is giving away complimentary red packets when you spend a minimum S$38.Treat your guests to a light, moist and yet fluffy Gui Yuan Cake from Thye Moh Chan. 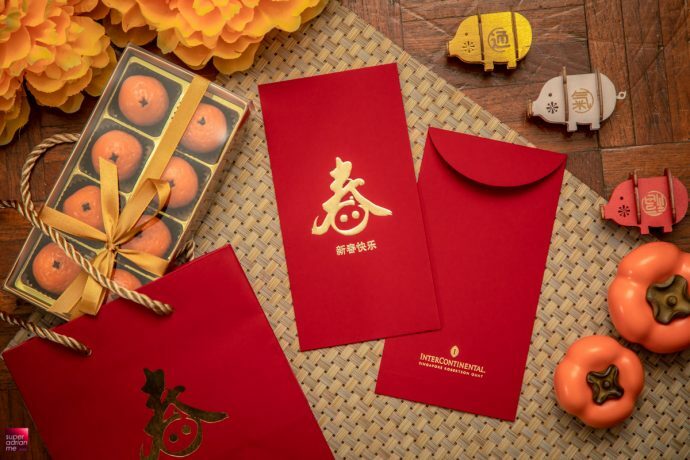 The S$12.80 cake is made with dried longan, walnut bits with hints of dark rum and is a great way to defeat those filling and yet heaty Chinese New Year treats. 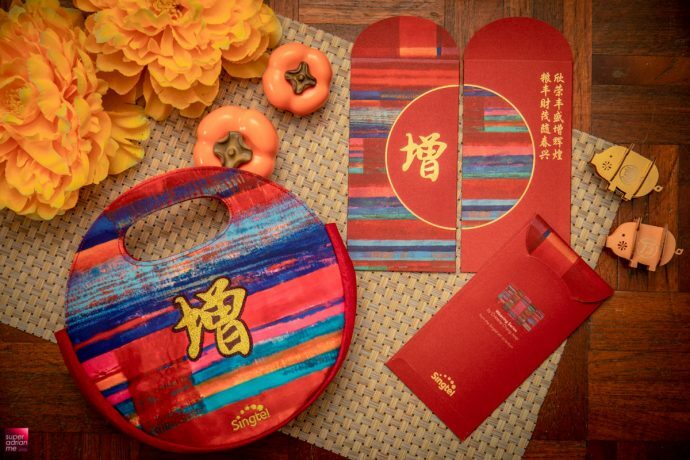 Treat your guests to a light, moist and yet fluffy Gui Yuan Cake from Thye Moh Chan. 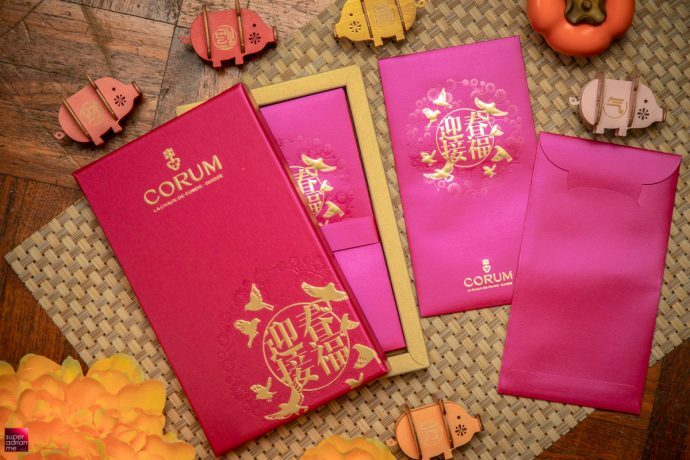 The S$12.80 cake is made with dried longan, walnut bits with hints of dark rum and is a great way to defeat those filling and yet heaty Chinese New Year treats. 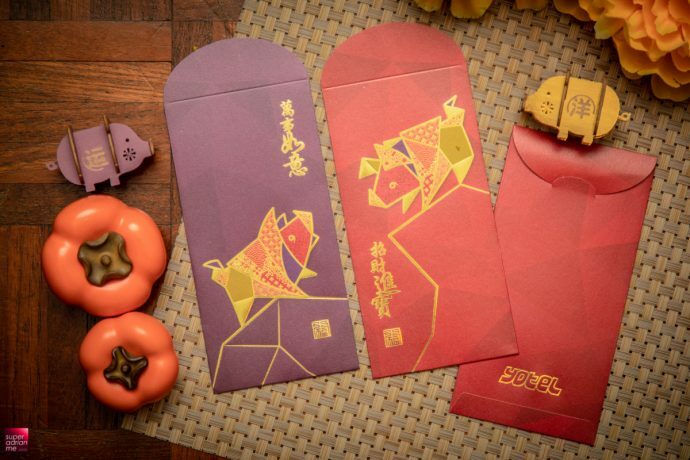 The Bak Kwa Tau Sar Pia contains dried barbecue pork (bak kwa) and tau sar filling in crisp golden-brown layers of pastry. 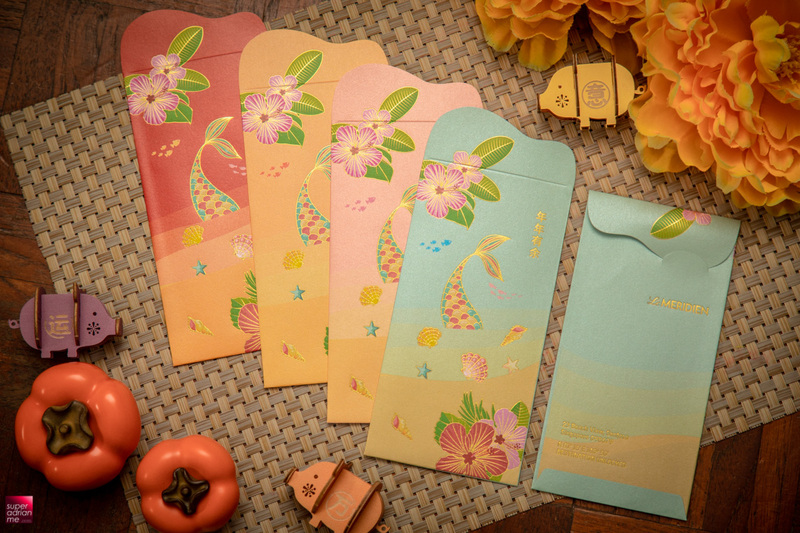 Priced at S$2.50 a piece or S$13.80 for a box of six. 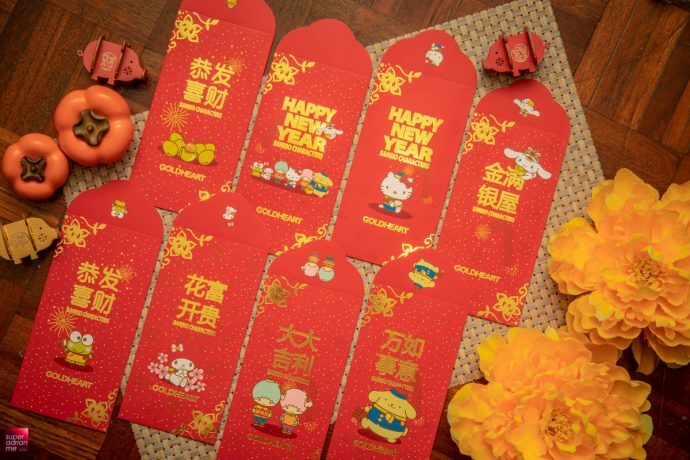 My favourite will be the new Golden Yam Mochi, a Teochew favourite. 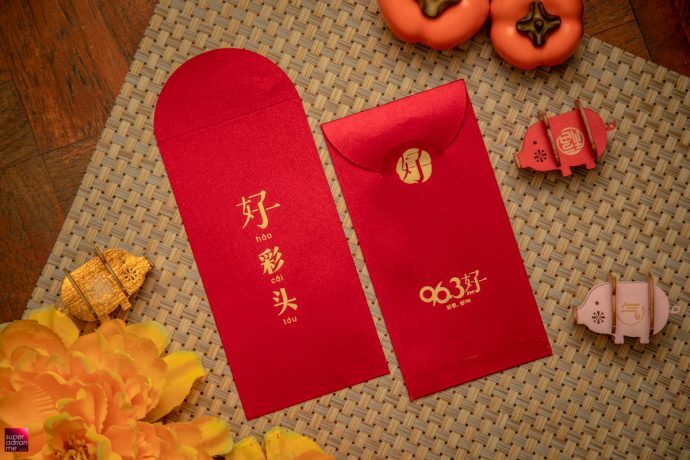 A black sugar mochi in yam filling is encapsulate in a fluffy buttery pastry. 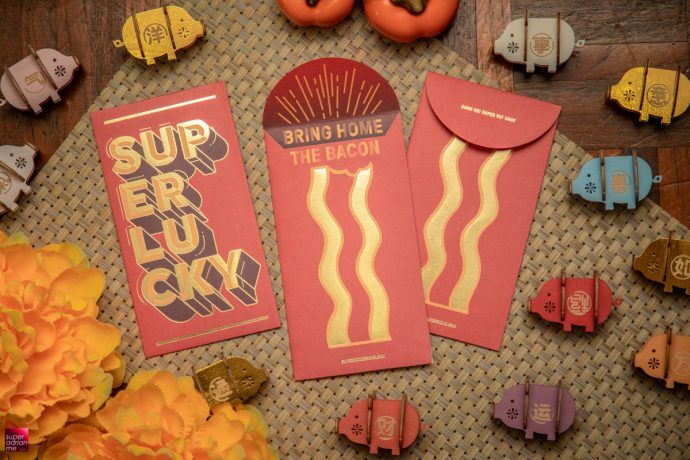 Surprisingly this isn’t too sweet. 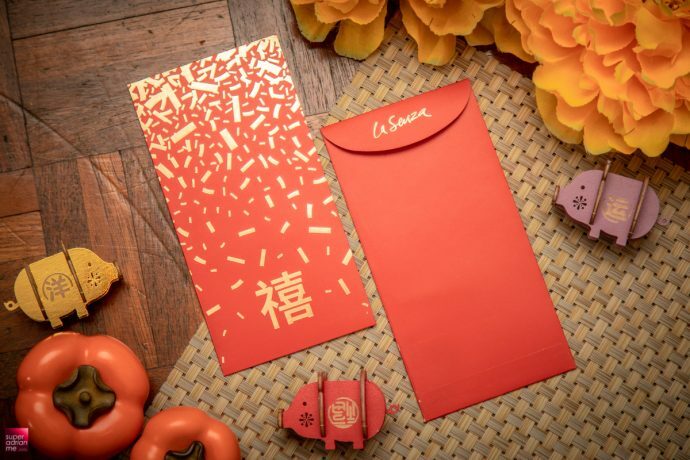 A piece costs S$3 or a box of four at S$12. 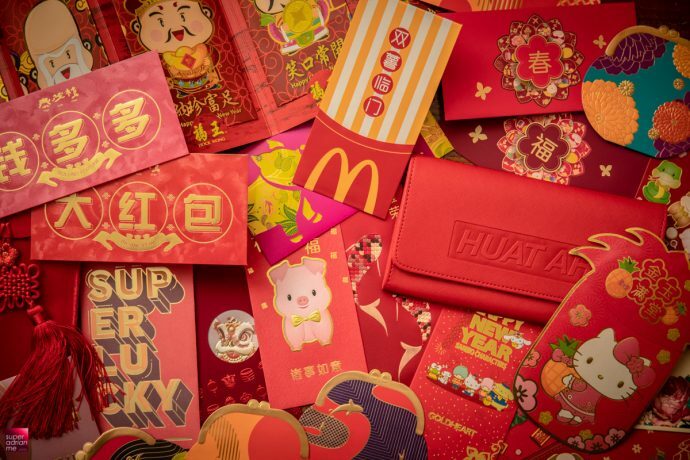 McDonald’s Singapore is offering customers a set of red packets featuring four different designs with every purchase of the Prosperity Feast in stores or via McDelivery and GrabFood while stocks last. 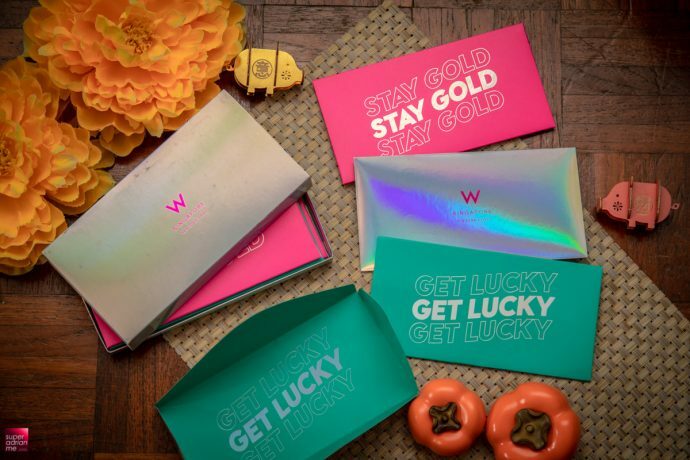 Purchasing the Prosperity Feast in store and via McDelivery by 27 February 2019 will also give you a chance to win one of three pairs of Prosperity Nestle Gold Wafer Bars worth S$868. 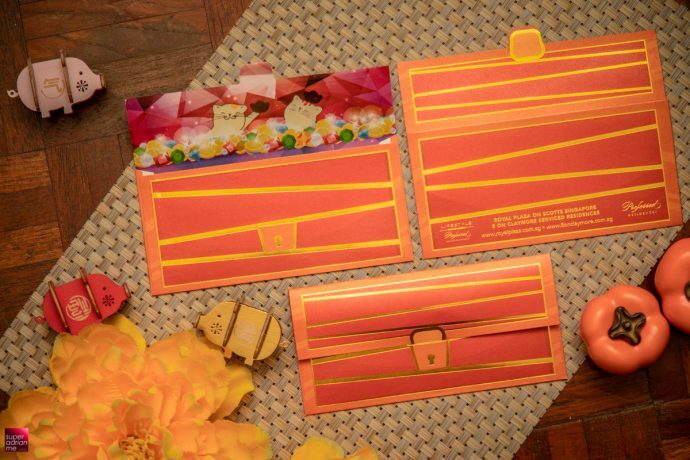 Pick up a trolley bag containing two 24-can packs of Carlsberg Green Label from your nearest supermarket. 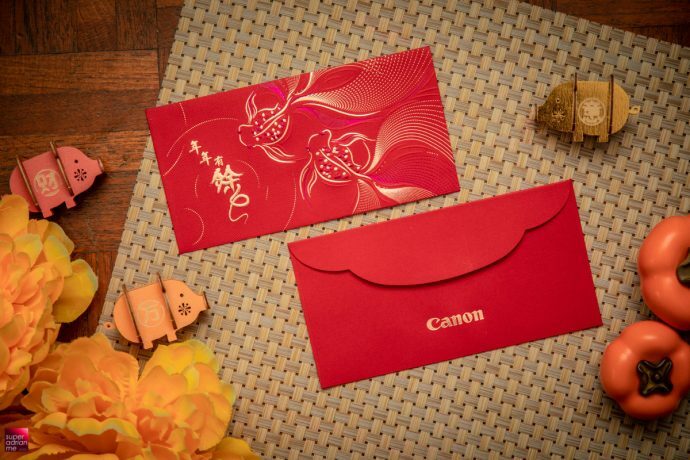 Easier to push around than lug around such weight. 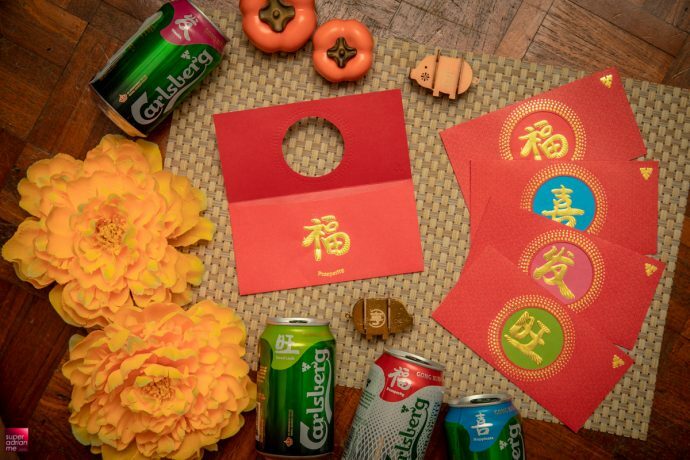 Carlsberg Smooth Draught is now available with two free cans for every 10-can pack purchased. 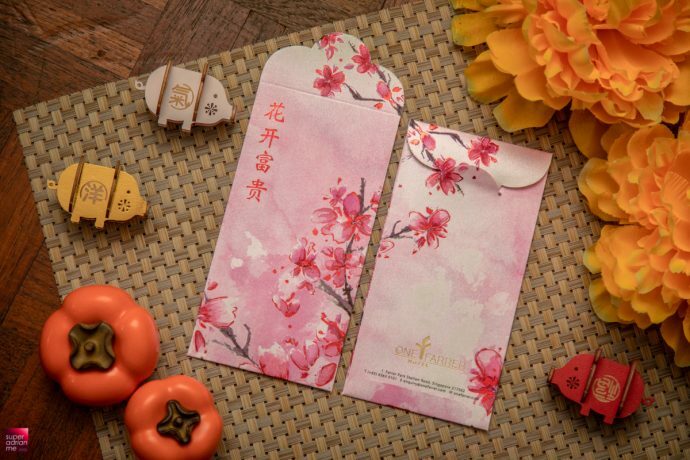 Give the prosperity 18-can pack instead of Mandarin Oranges. 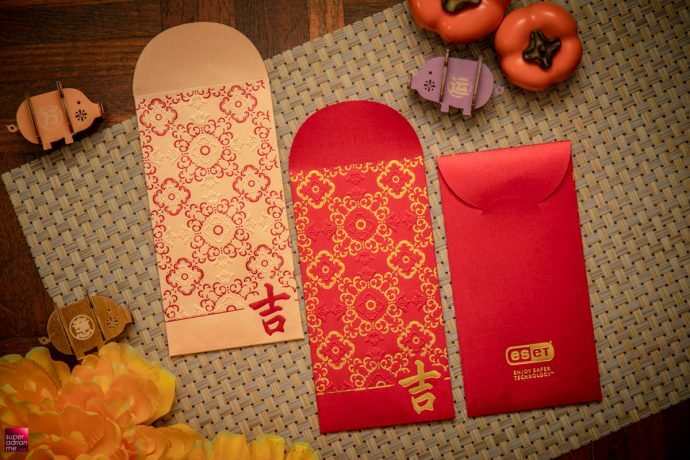 Each can of beer comes specially designed with auspicious well-wishes that will go well at the reunion table. 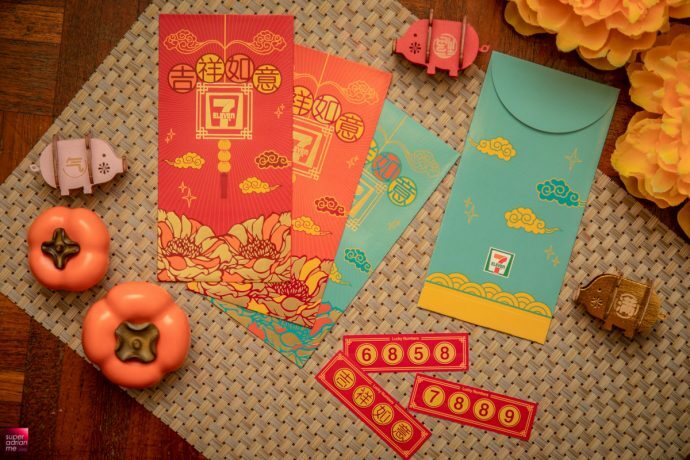 Also get the chance over S$438,888 worth of cash and prizes this celebratory season. 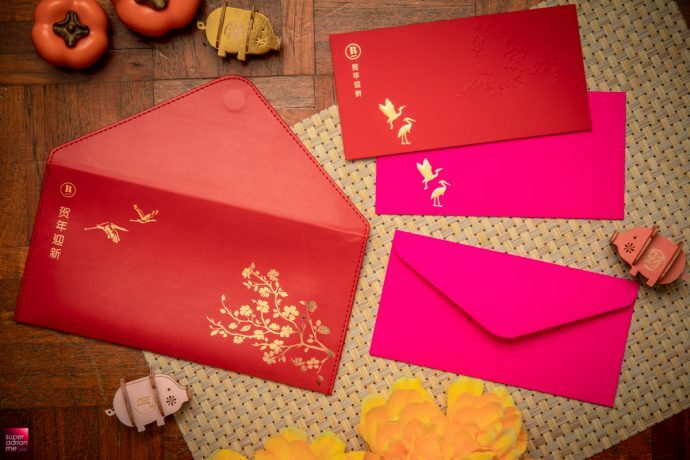 If you are not a fan of “RED” red packets, here are some colour designs that red is not the prominent colour. 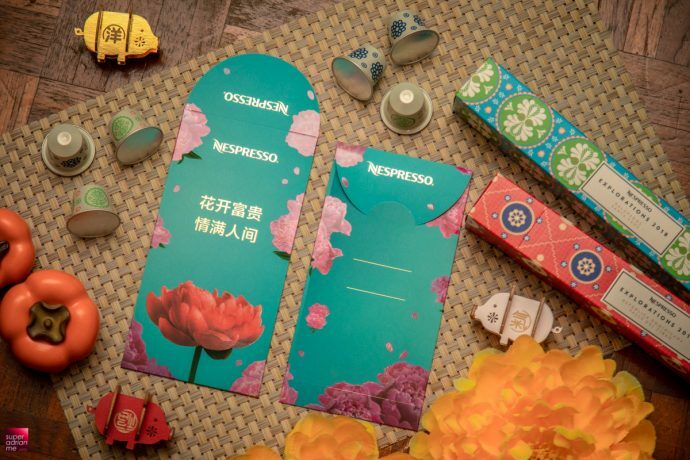 Nespresso has collaborated with key influencers to create special coffee creations for the lunar new year. 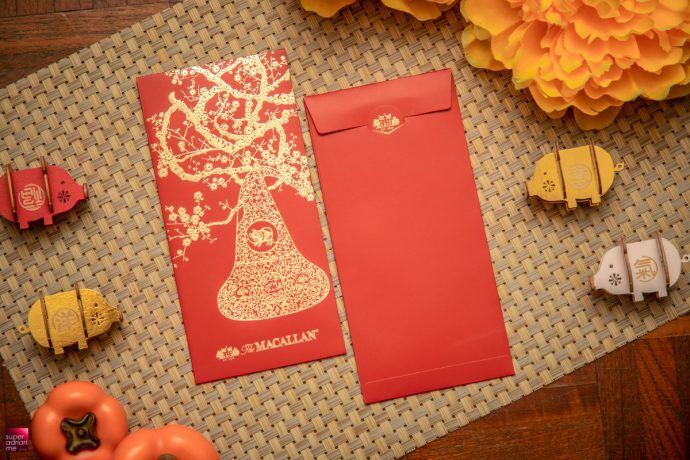 Bella Koh from Singapore has created the Mushroom Latte with Date Syrup and Gold Leaf. 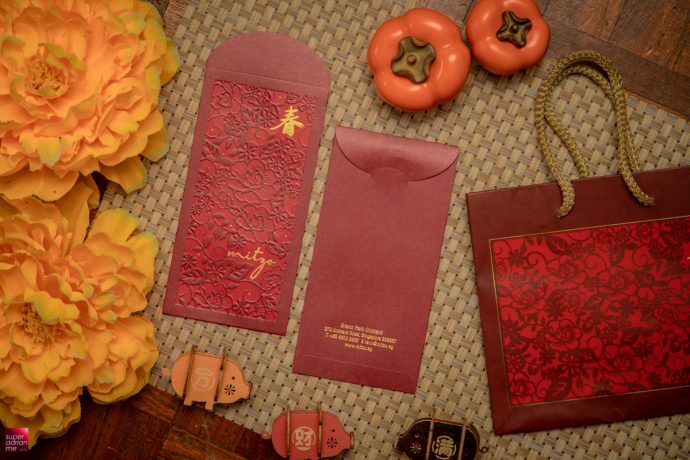 Hong Kong’s Jeff Law’s creation is the Red Velvet Coffee created with beetroot. 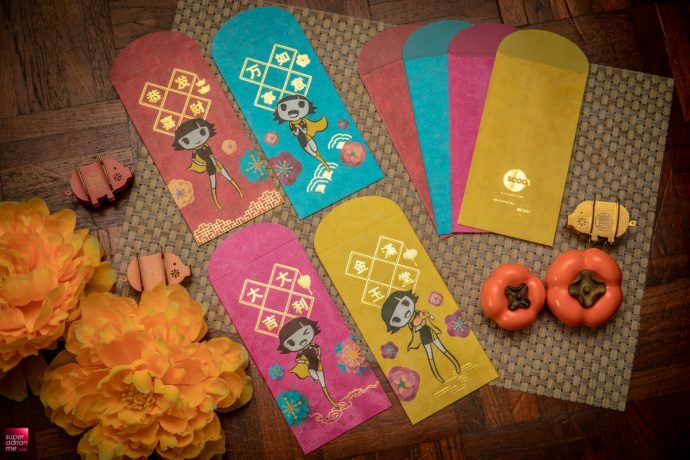 Taiwan’s Lulu Wei’s creation is Longan Coffee. 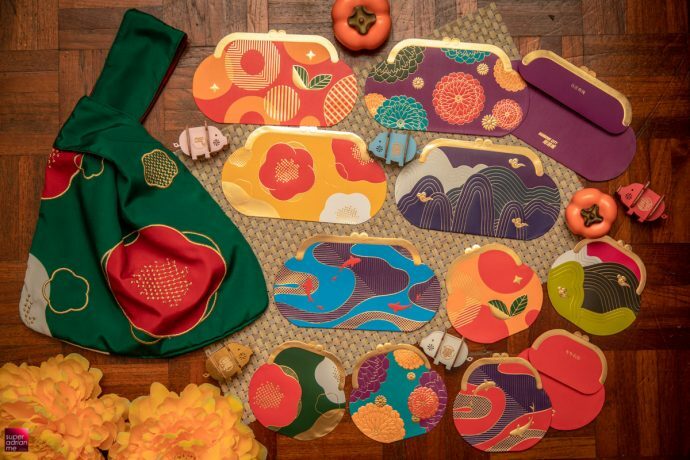 You can taste Bella’s Mushroom Latte with Date Syrup and Gold leaf creation at Nespresso stores in ION Orchard, VivoCity, Raffles City and Takashimaya on 19 to 20 January 2019. 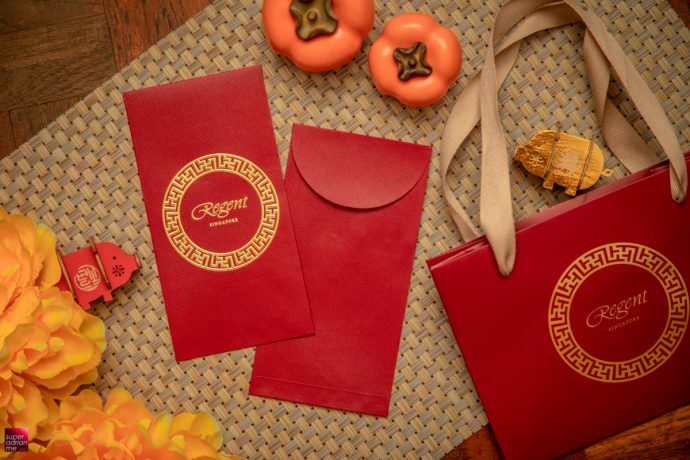 Red Velvet Coffee is available from 26 to 27 January while Longan Coffee is available from 2 to 3 February. 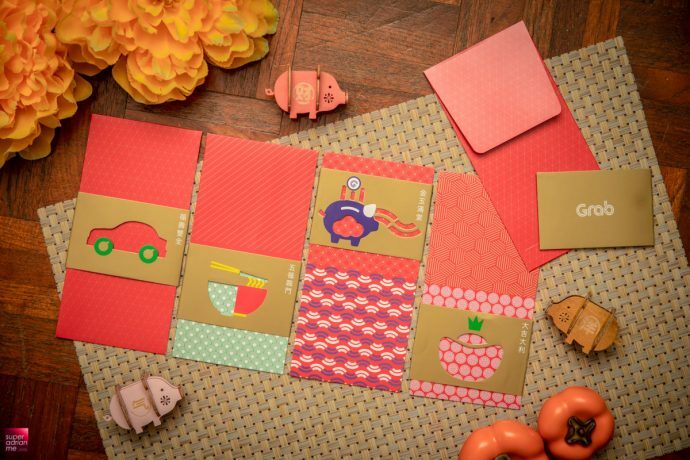 These recipes can be replicated at home. 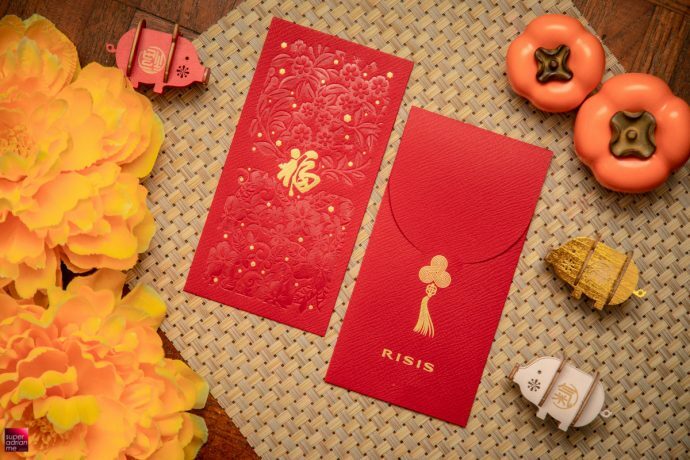 And if you don’t have a Nespresso machine at home, there is a Essenza Mini machine bundle and Chinese New Year Eight-Sleeve Pack for S$248 or the Pixie machine bundle and Chinese New Year Eight Sleeve Pack for S$338. 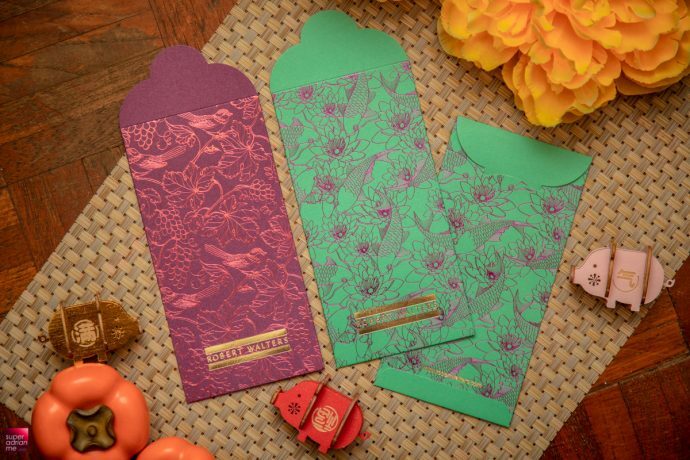 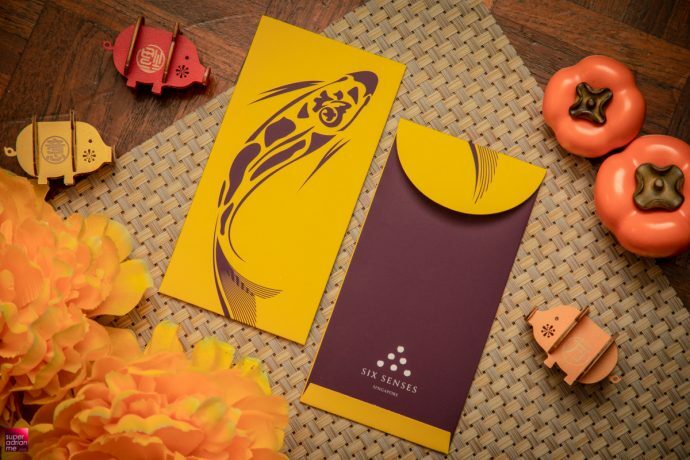 These red packets from Le Meridien Singapore Sentosa are inspired by the hotel’s tropical island surroundings. 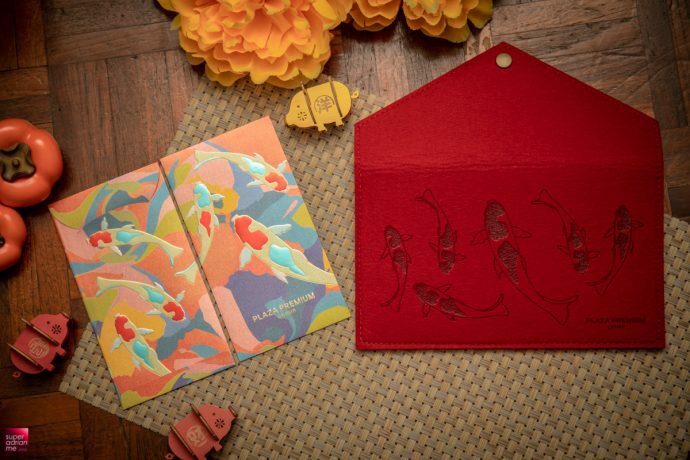 They are represented with a fish leaping into the ocean. 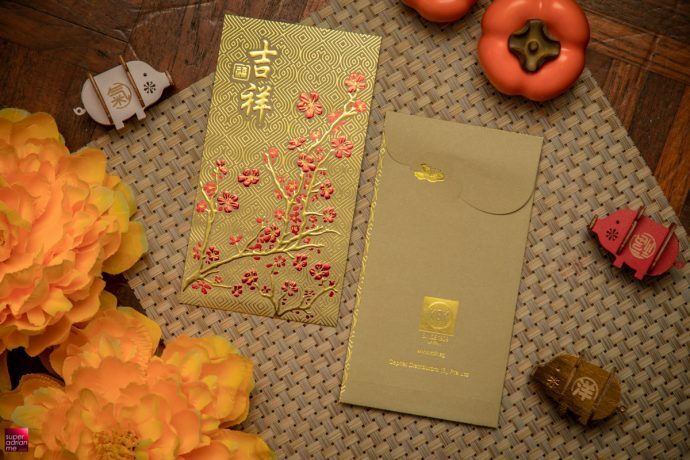 This signifies abundant blessings for the year. 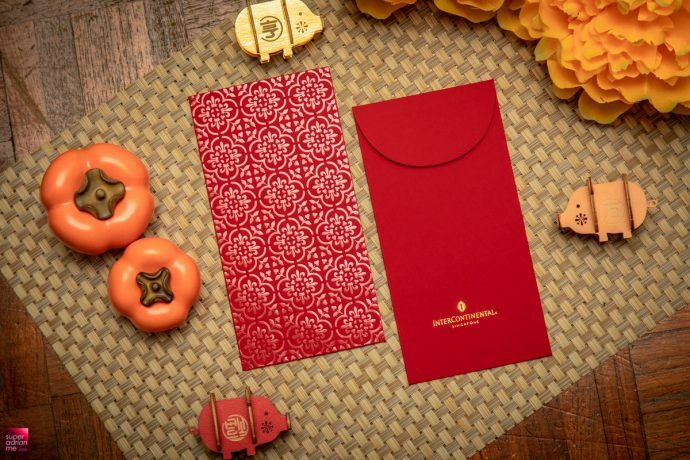 The hotel is giving these red packets and to diners who dine at Latest Recipe, their all-day dining restaurant. 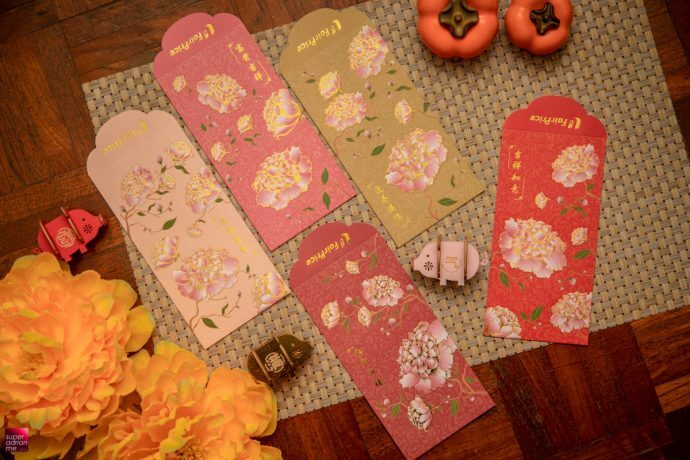 Smove car-sharing company has designed their red packets featuring flowers lined with cars. 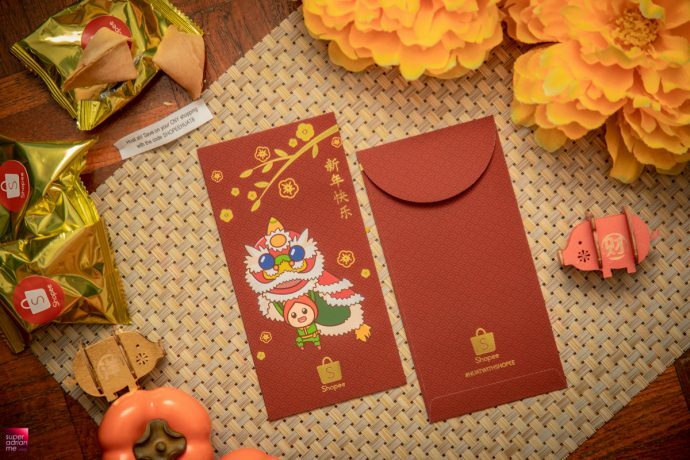 Here are the red packets that will remind you of the “TONG TONG CHIANG” lion dancing troupes coming to do round at your home or sometimes at your office too during this festive season. 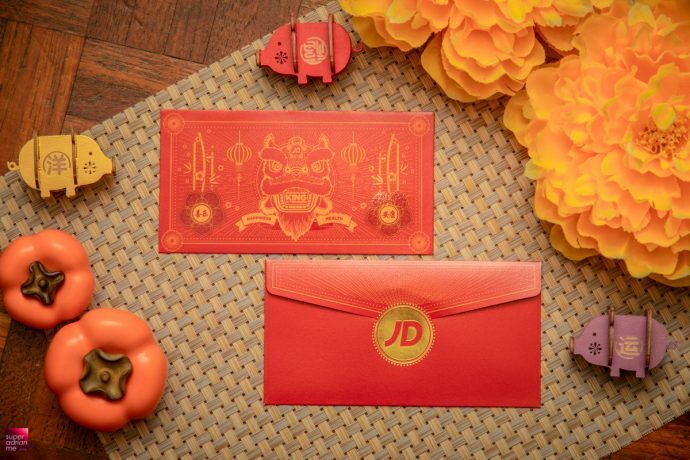 JD Sports is giving away these limited edition JD design red packets (5 pieces) with every S$160 spent in a single receipt. 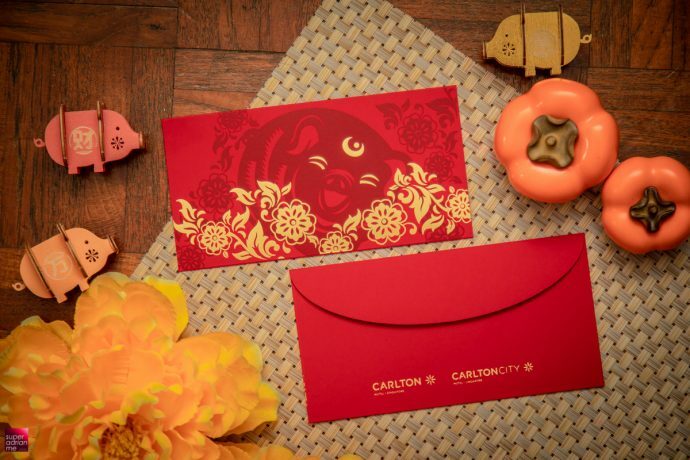 The design showcases a modern twist to the traditional lion dance, commonly performed during Chinese New Year to usher in good luck and fortune for the year. 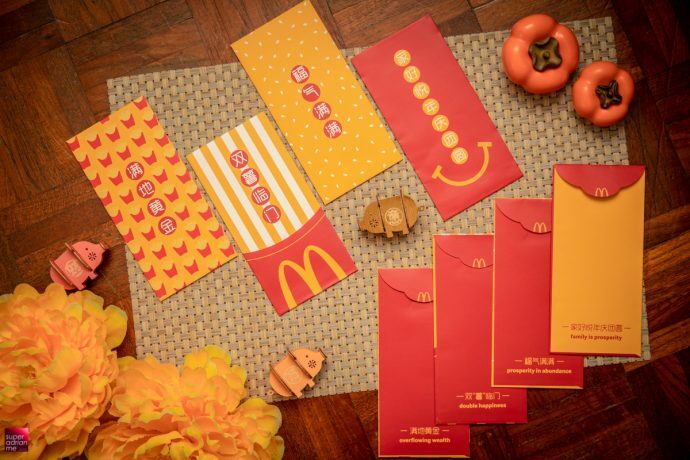 Sometimes we want it plain but not so simple. 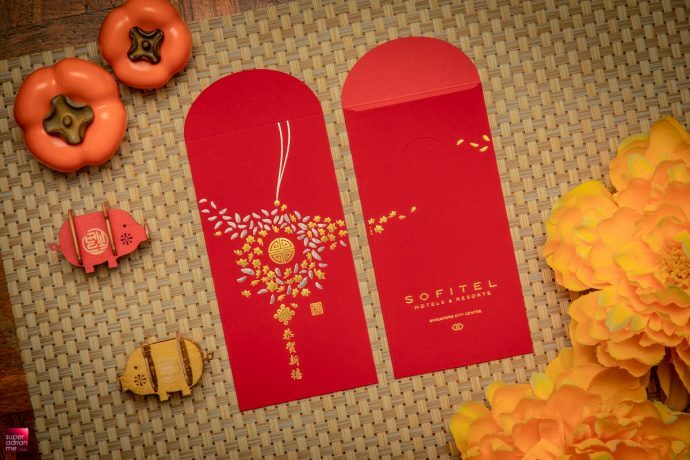 Here are some sophisticatedly designed red packets that might suit your taste. 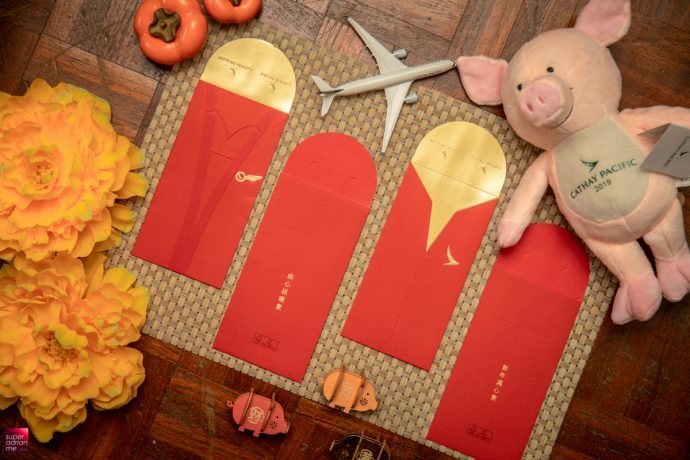 This year’s red packet design from Cathay Pacific and Cathay Dragon features the respective cabin crew uniforms, a move away from the very plain traditional designs from the previous years. 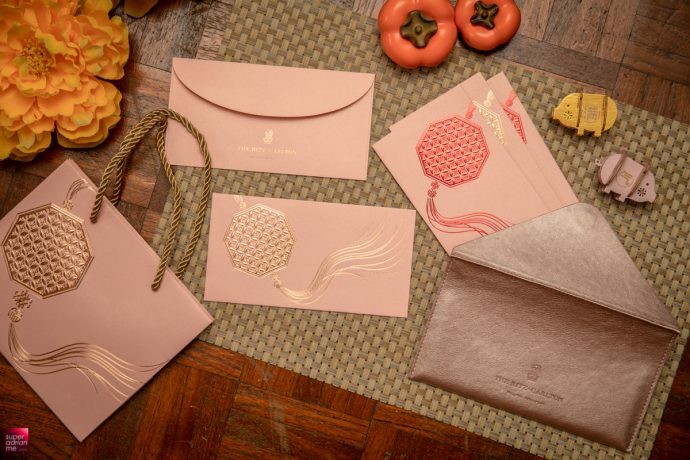 We think these are absolutely beautiful. 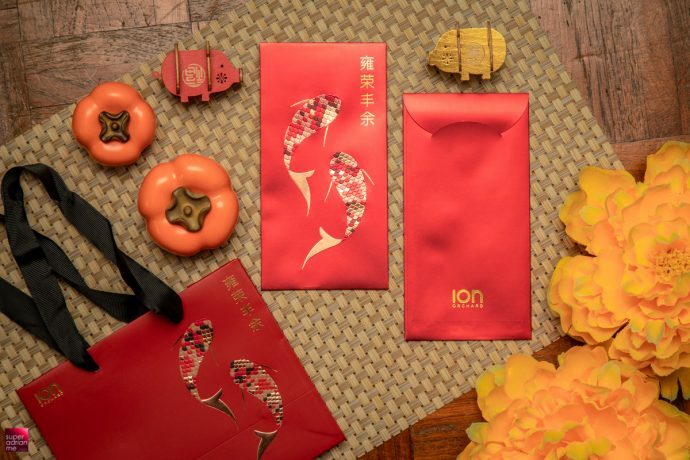 ION+ Rewards Members or American Express Card members can redeem an exclusive set of the red packets from ION Orchard as well as a mandarin orange carrier with a minimum spend of S$80. 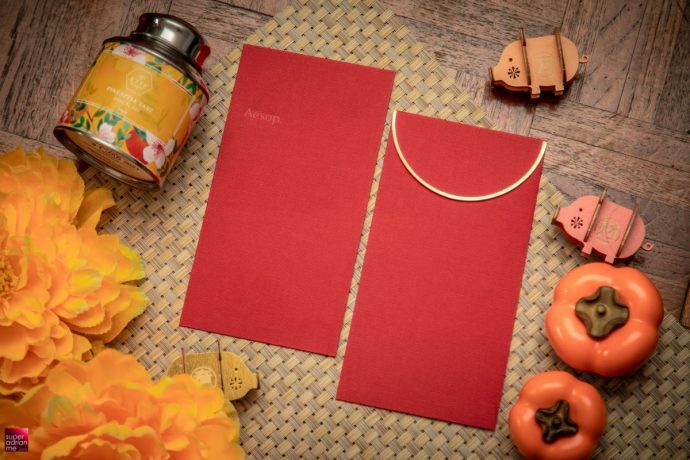 Simplicity at its best. 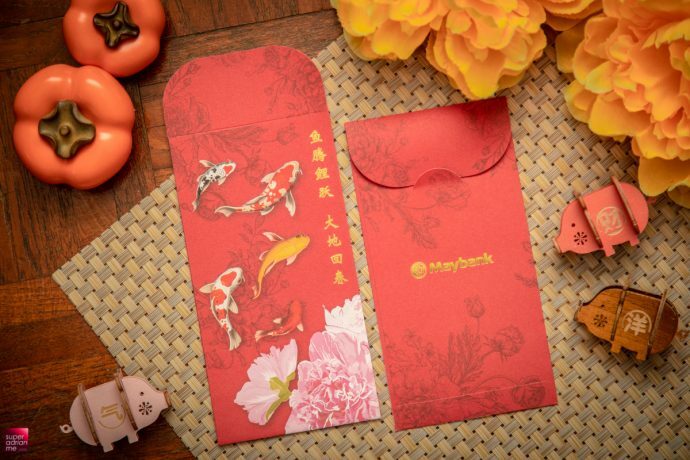 Sometimes, it doesn’t have to be that fanciful. 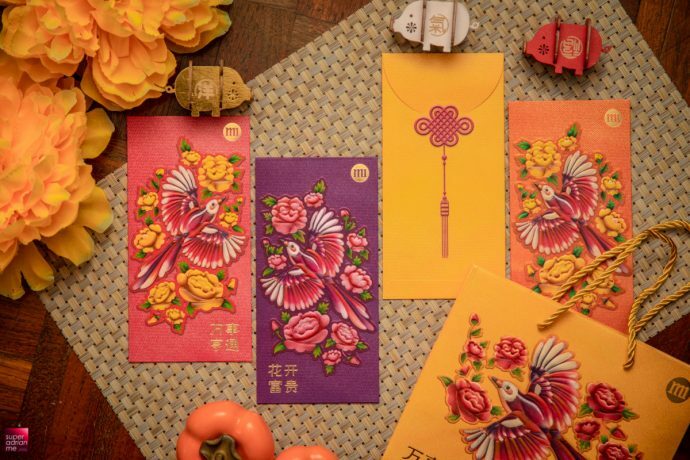 Just keep it traditional. 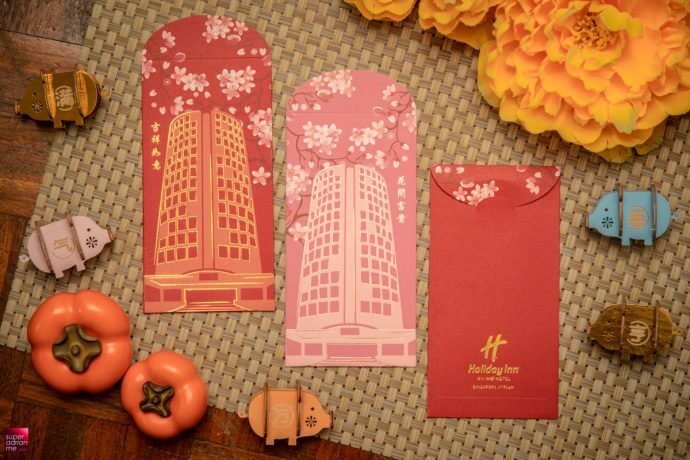 Shama Serviced Apartments’ red packet theme for the year of the pig is “Fortune Comes with Blooming Flowers” 花开富贵. 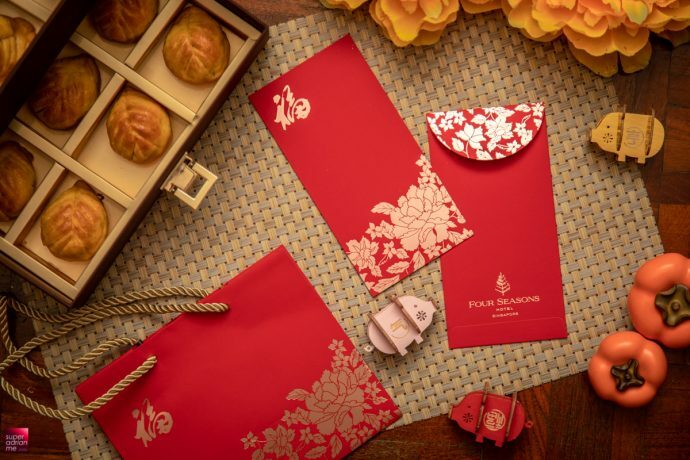 Last year, five new Shama properties opened across Asia – Shama Daqing Heilongjiang, Shama Island North Hong Kong, Shama Lakeview Asoke Bangkok, Shama Changfeng Shanghai and Shama Hongqiao Shanghai. 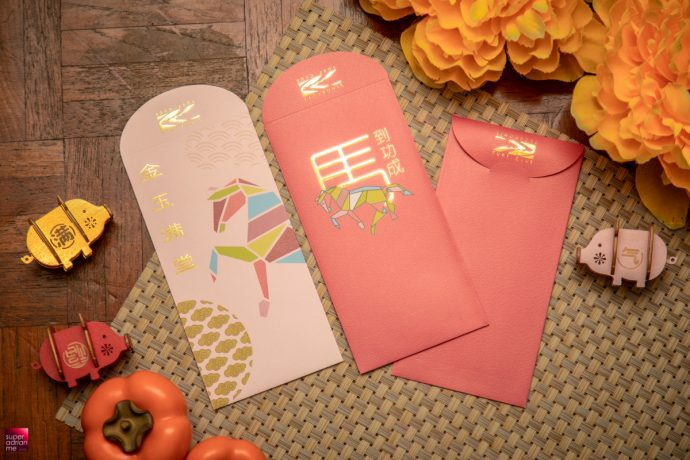 One Raffles Place invites shoppers to experience the Splendour of Spring with a “Forecast Your Fortune” exhibition on levels three, four and five. 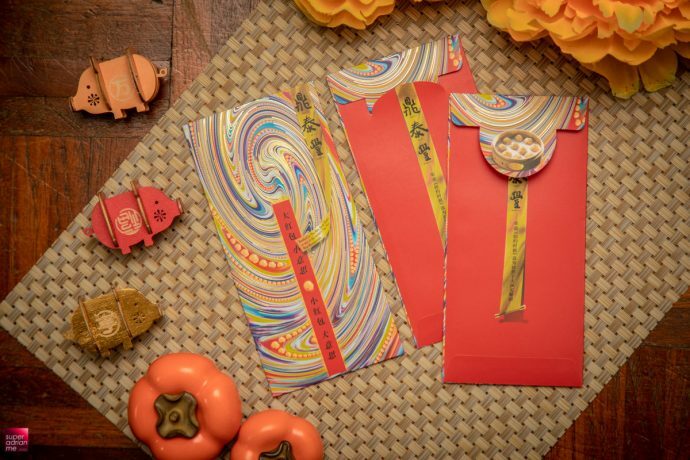 Check out the Zodiac sign installations and zodiac predictions for 2019 written by Master Bro Alec Chia, Singapore renowned Geomancer and Numerologist. 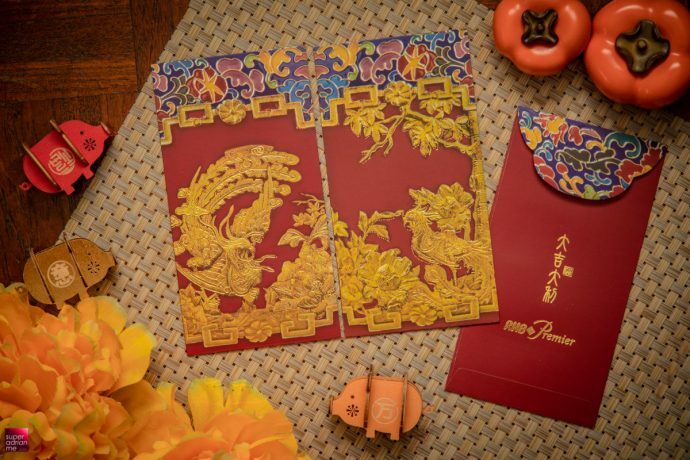 Singapore based company The Vine Culture offers Business Consultancy and Relationship Consultancy services through its two businesses Vine Consultancy and Covenant & Vows respectively. 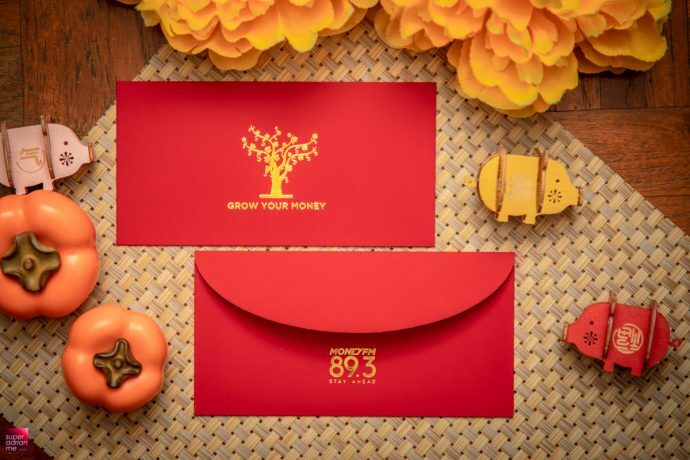 This husband and wife team hopes to see more businesses and relationships prosper in the marketplace. 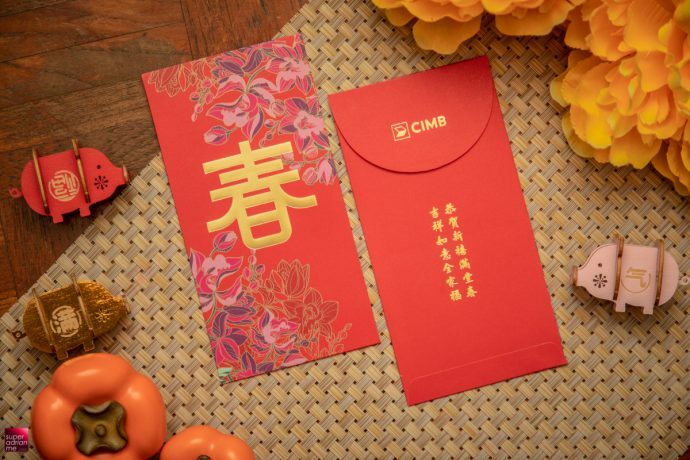 CIMB Singapore and CIMB Malaysia will be running an online game on their respective Facebook Pages during the CNY period. 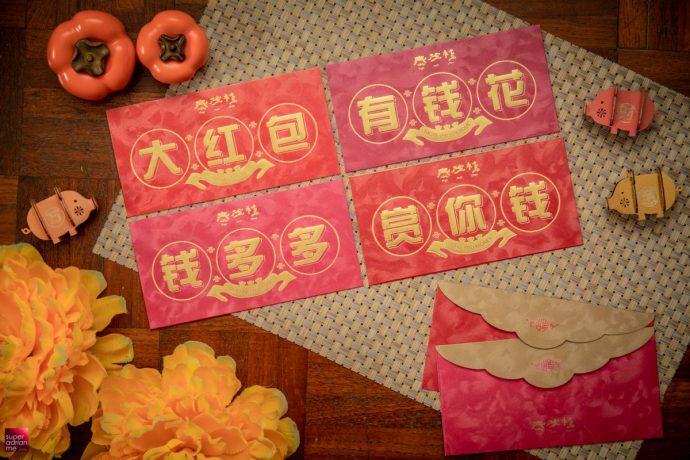 Called the ‘Prosperity Toss’, it is a game where participants get to toss Yu Sheng for 30 seconds in one setting to earn points. 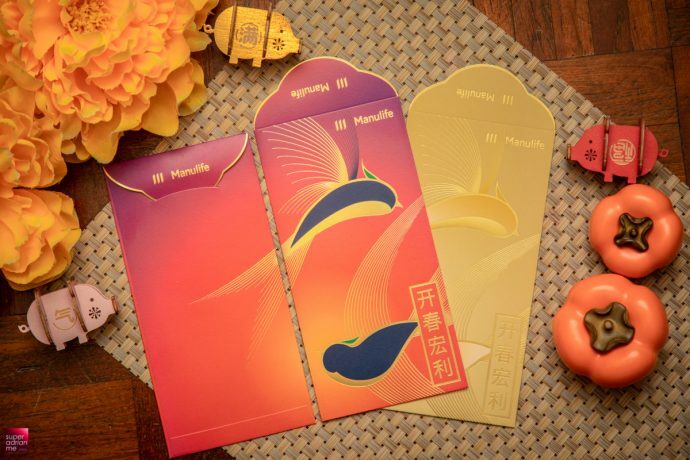 These points will accumulate over a course of two phases and participants stand to win prizes. 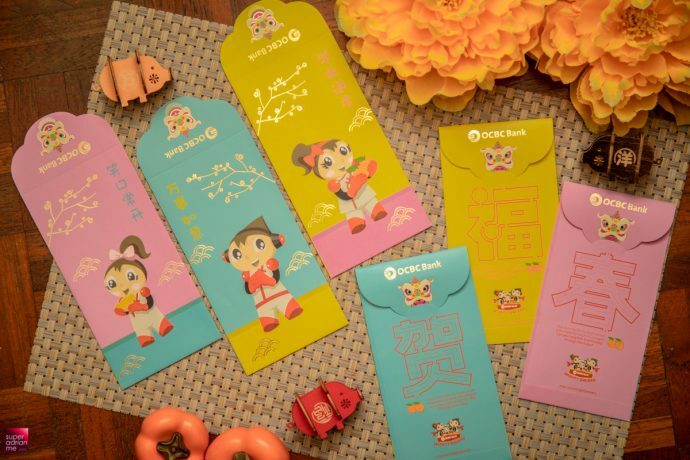 The top 10 participants with the highest points for each phase gets to bag home prizes. 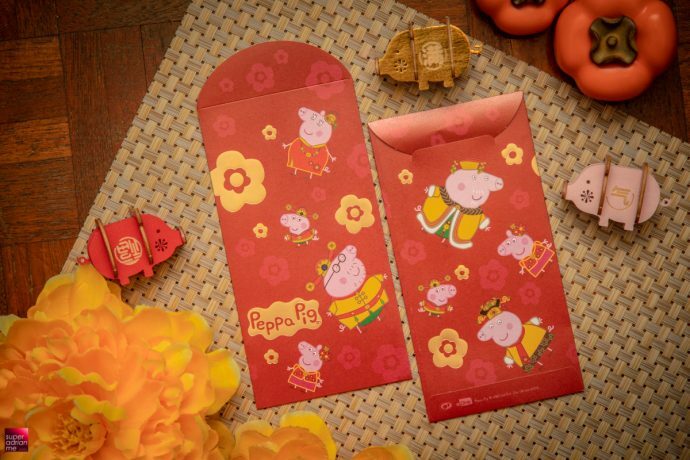 Red packet how to buy?